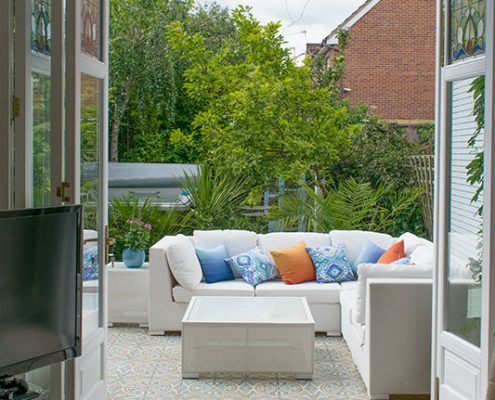 How do you make the most of a long, hot summer? 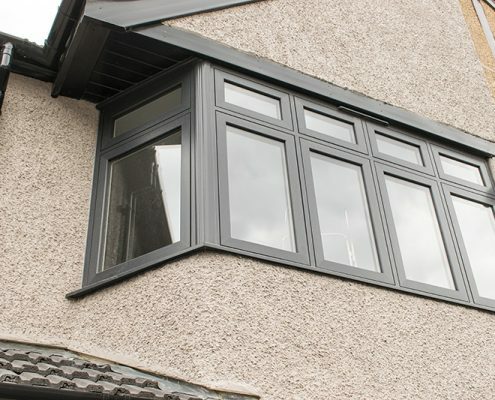 Enfield Windows can show you how! 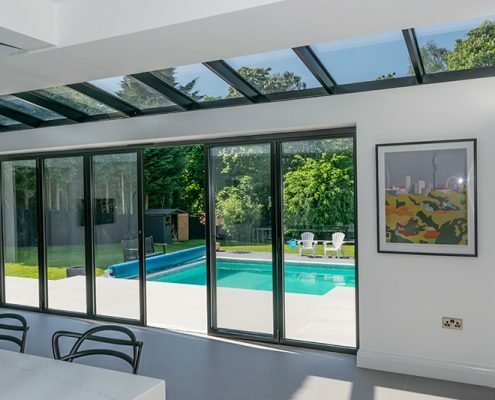 In this blog, we are proud to showcase a fabulous glazed extension that we recently installed on a lovely property in Cuffley. 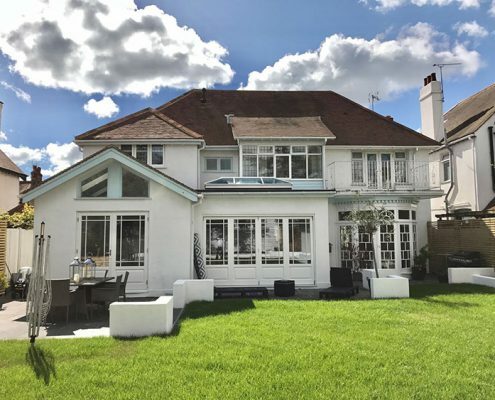 As in most cases, our clients found us through an internet search and we quickly arranged to go to the property for a site meeting with the owners and their builder. 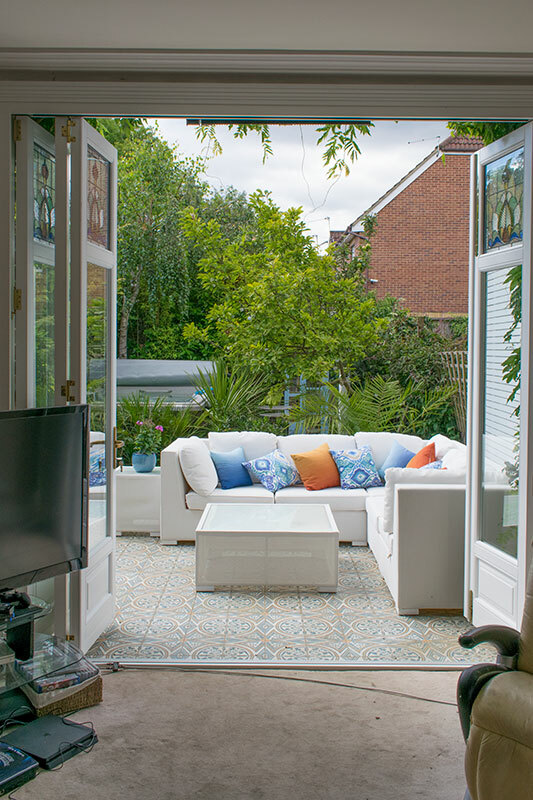 Their brief was to transform the kitchen and dining area at the back of the house where it faced the swimming pool and garden. 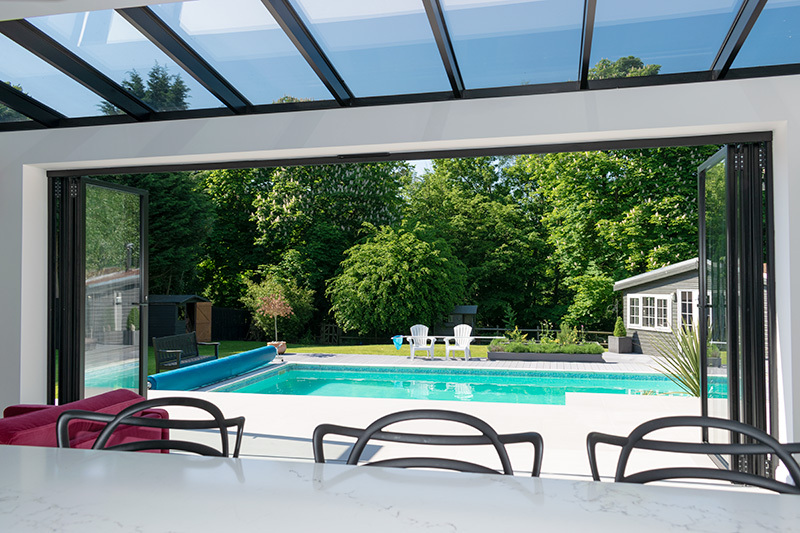 Our clients wanted a big and airy space with a glass roof and large folding doors that would fully open to create a stunning alfresco area flooded with natural light. After much discussion, we suggested some options and products that would be a good fit for the project. 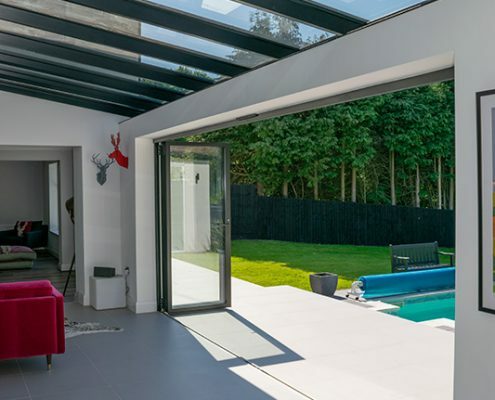 Our clients favoured the Atlas roof system, which has a super slim architectural beam which is only 40mm thick. 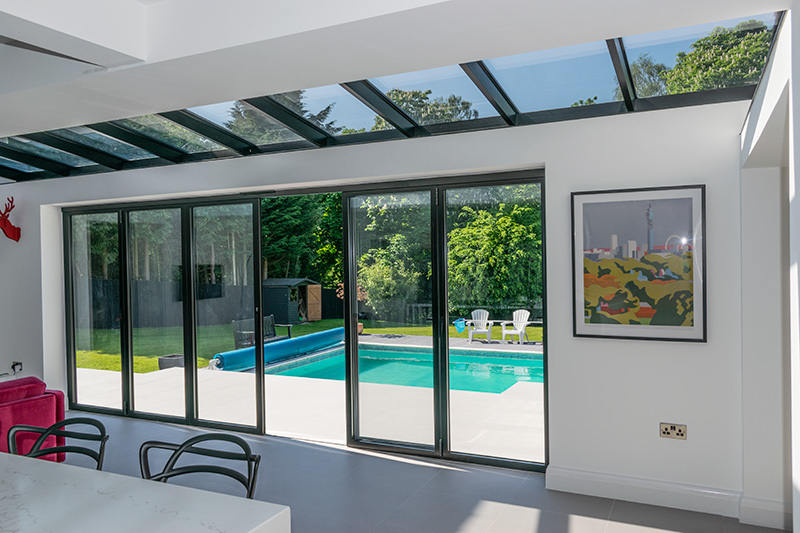 The colour was to be jet black with self-cleaning active neutral solar-controlled glazing to ensure the room remained cool under strong sunlight. 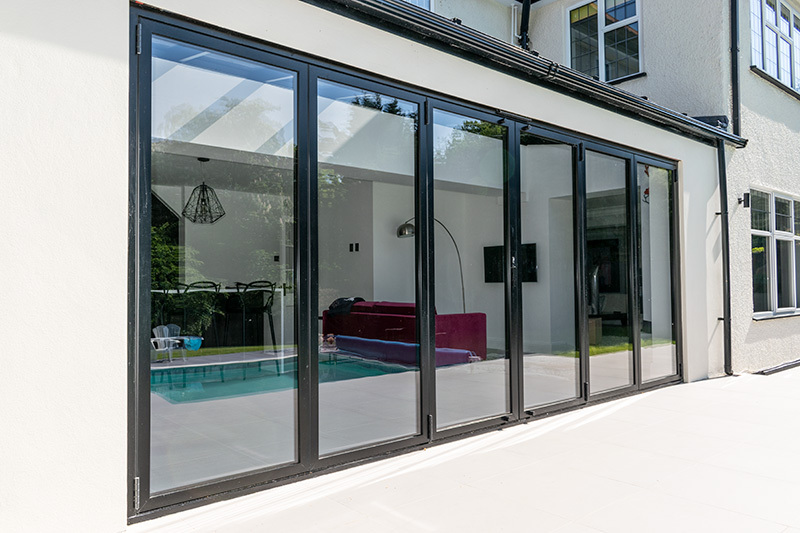 The bi-folding doors were also to be jet black and ultra slim with a 55mm frame, divided equally into six sections containing A-rated toughened 24mm glass. The door sections would be split three-three in the middle to fully fold back to the side walls. 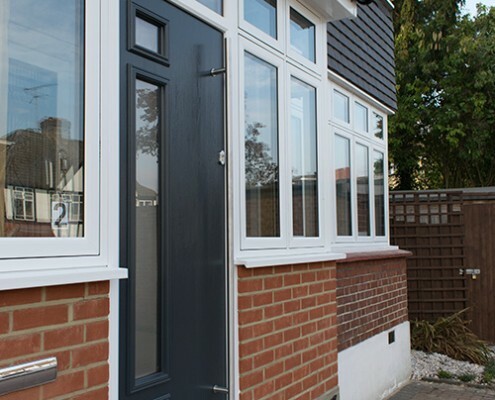 Now, one big advantage of using Enfield Windows is that we have an experienced surveyor with over 20 years’ experience in the industry – including hands-on installation work. 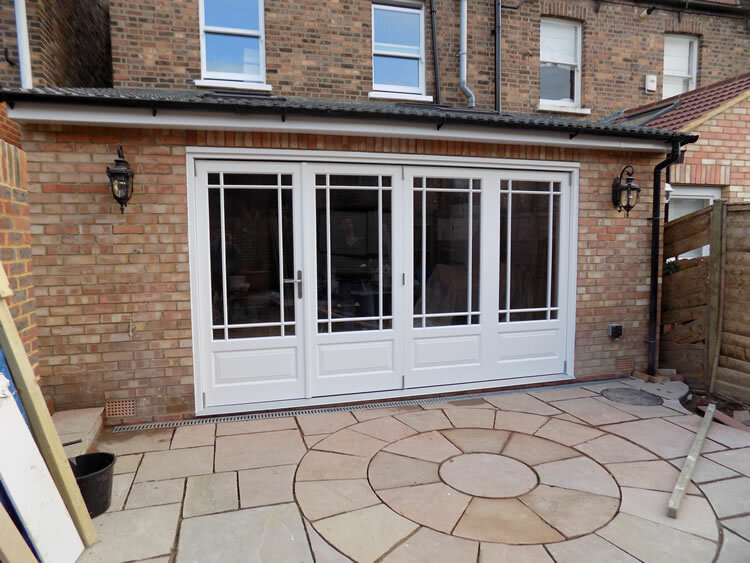 His job was to make sure the roof and doors would fit perfectly onto the builder’s new brickwork. 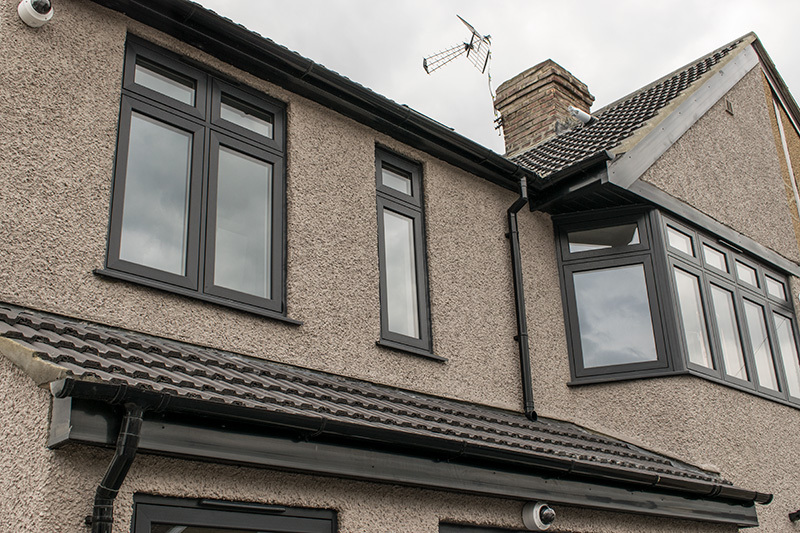 The lead time for the chosen products was up to four weeks, during which time the installation date was booked in and the materials purchased to enable a swift and thorough installation. 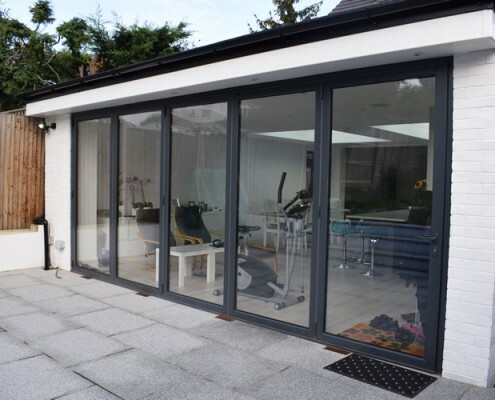 We began by installing the roof with weather-sealed lead work, followed by the fitting of the bi-folding doors – all of which took only three days to complete. 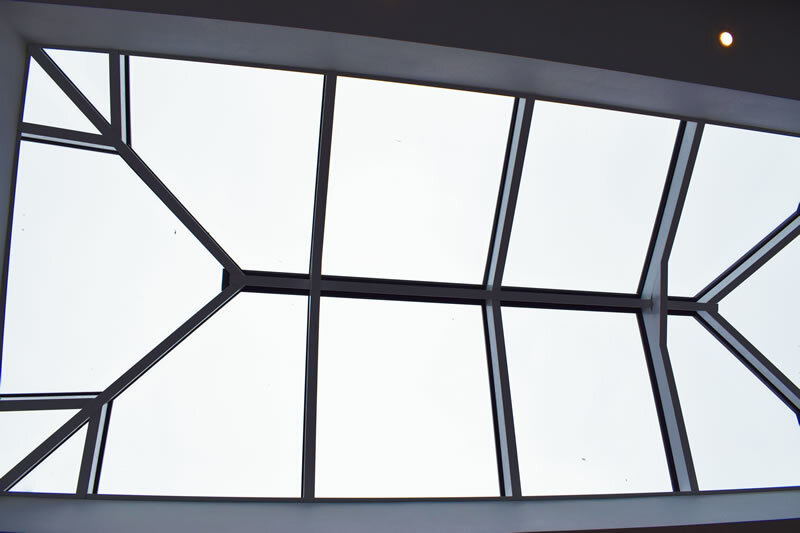 As the pictures show, a fully glazed roof system gives a wow factor that you simply can’t get from velux windows set in a tiled roof. 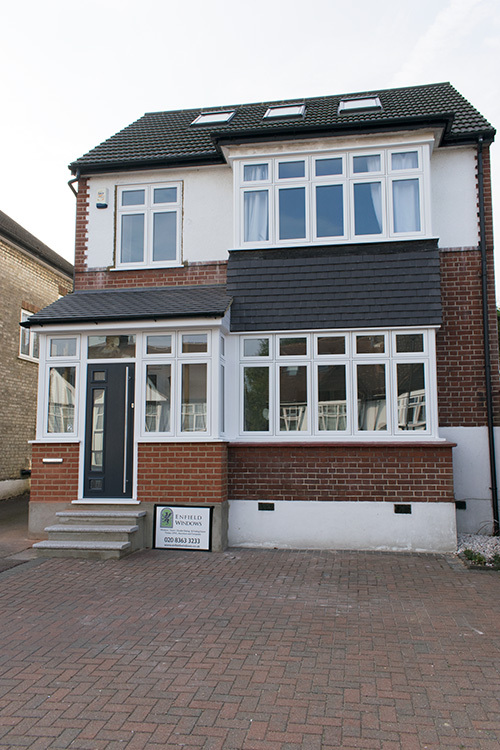 Our client was delighted with the bright new look to his property created by Enfield Windows. 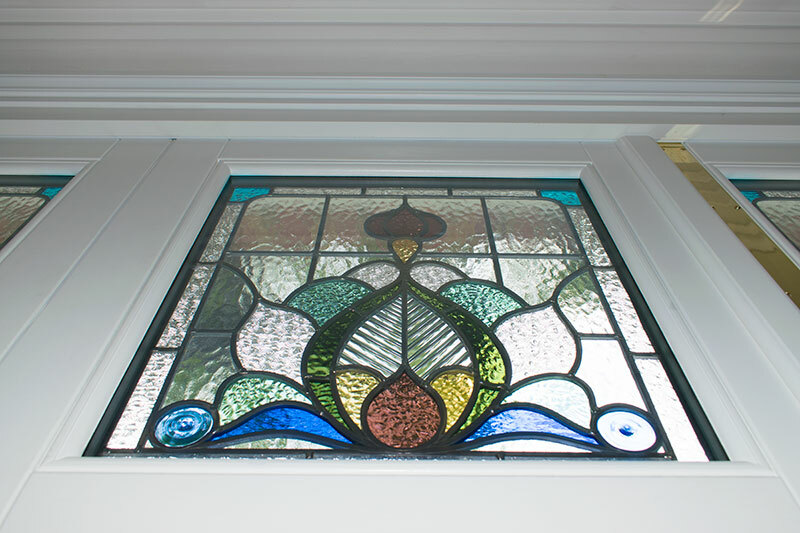 As the old saying goes: “the eyes are the windows to the soul.” Here at Enfield Windows, our motto could be: “the windows are the soul of the house” because there’s nothing more important for the look of a house than the quality of its windows. 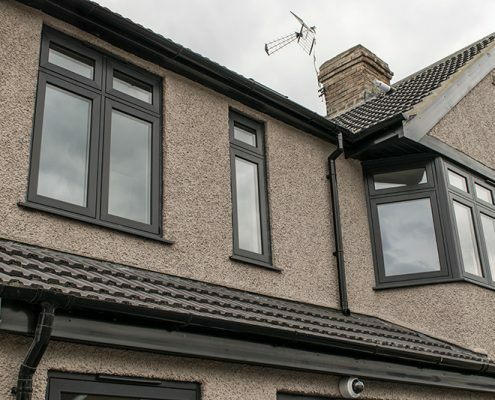 Our recent uPVC flush windows installation was in Edmonton, north London where the client was going for a complete refurbishment, as well as adding a loft and rear extension. 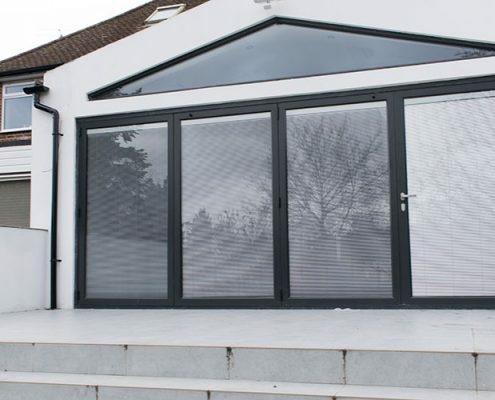 We were referred by a top building company we have worked with over the last year. 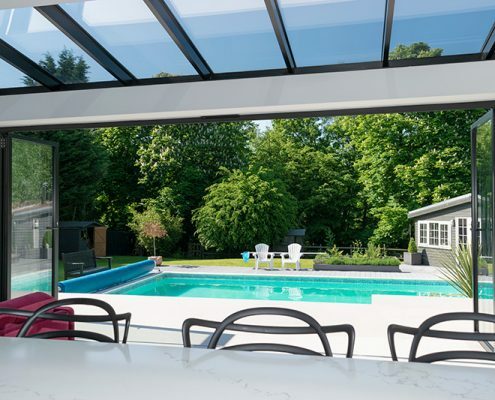 After the initial call was made, we arranged a site visit to discuss the windows required, the product type and requirements the client had for the project. 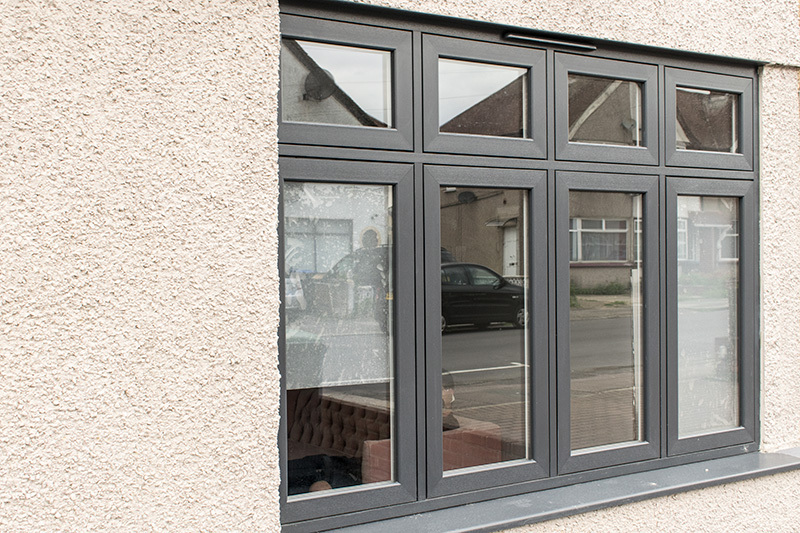 The majority of uPVC windows come with a foiled finish. 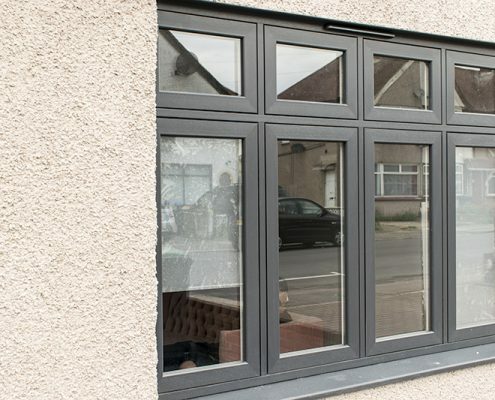 At Enfield Windows we have sourced a flat grey (non-grained) window with a flush casement, giving the look of a modern window with the added benefit of a unique graft weld system that creates seamless joins in every corner of the frame. The bi-folding doors to the rear were to be made of aluminium because of the wide six-metre opening. 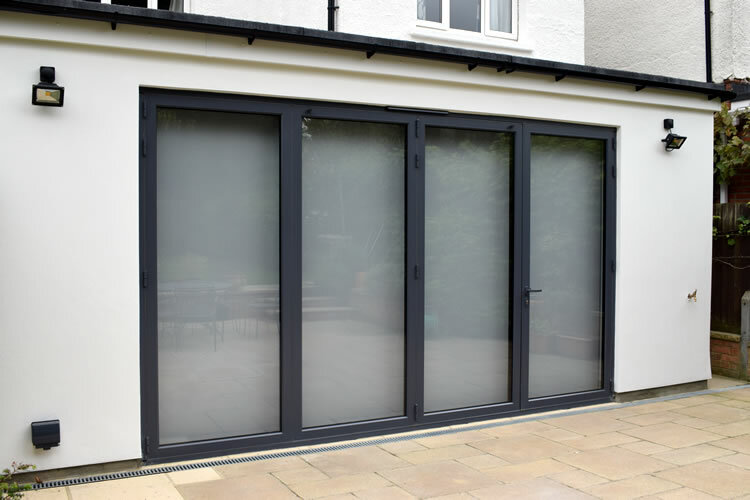 At this size, bi-folds in aluminium or timber are far superior to uPVC doors. 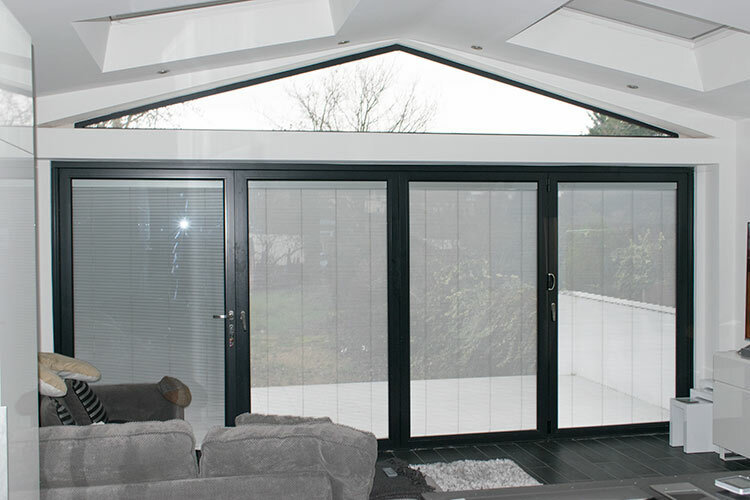 Finding a good placement for blinds in bifold doors can be a problem and can sometimes detract from the stylish look of the doors. 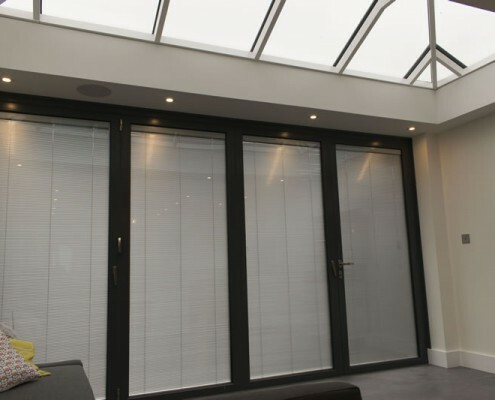 In this case, our client had opted for electrical blinds which are concealed inside the two glazing units and can be operated using a simple remote control. This gives a sleek and stylish finish. 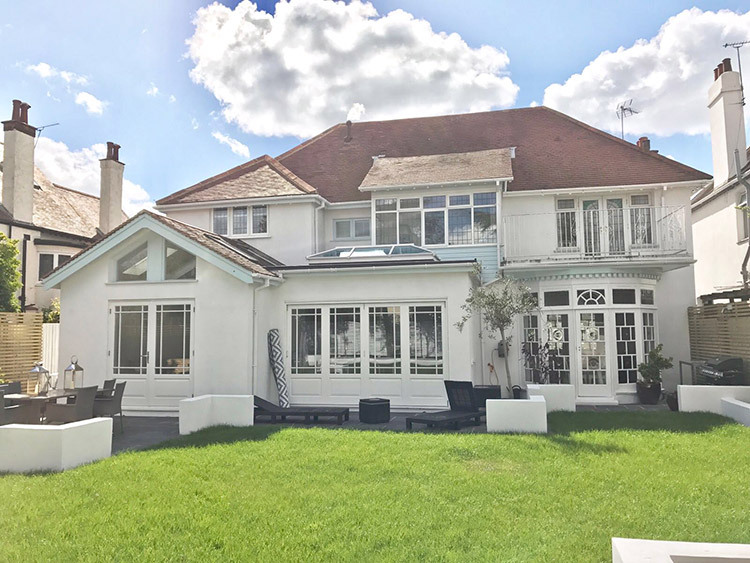 Within days the client received our quotation, giving a detailed breakdown of all the locations to each window and door, plus glazing requirements for the project. 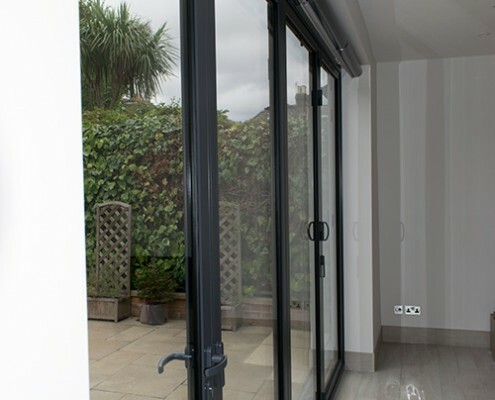 The client came back with some tweaks regarding the choice of handle for the doors and windows and once amended, the quotation was revised to a contract. We then made arrangements for a deposit payment and of course, a full site survey. 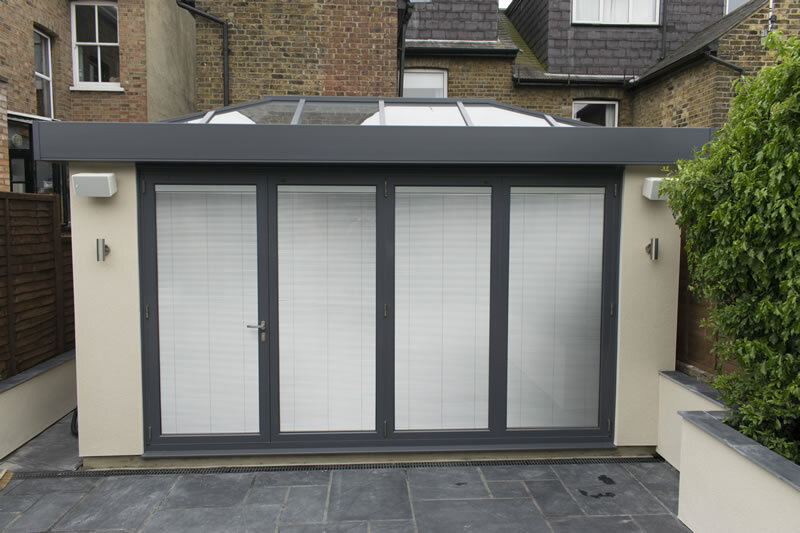 Lead time for the grey flush windows doors is three weeks and four weeks for the blinds. 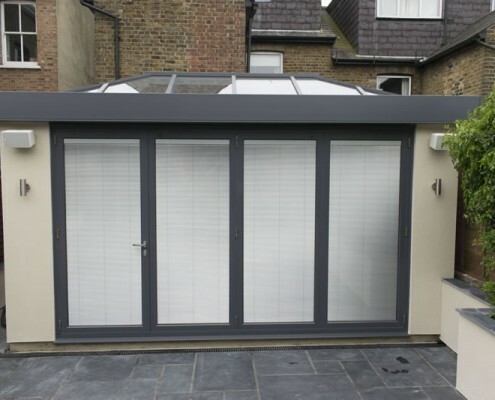 During that time the installation was booked in to be carried out over four days with the blinds to follow a week later. The house now looks fantastic, a complete transformation. What could have been just another house in the street is now the envy of the neighbours. 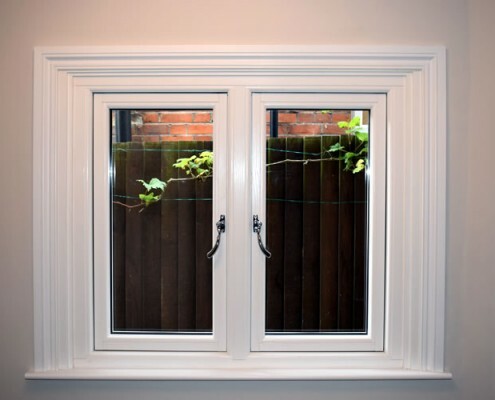 For more information on our Flush graft weld uPVC windows please contact us or make an enquiry through our website. 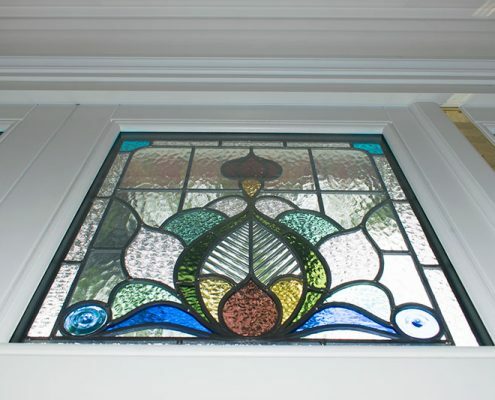 Here at Enfield Windows we pride ourselves on being able to replicate stained glass windows and to match any bespoke design. 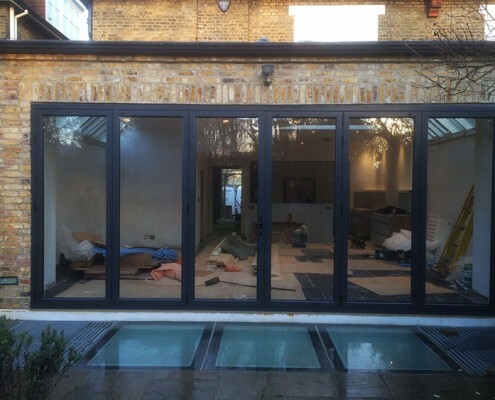 This was something that came in handy on our recent installation of timber bifold doors in Finchley, north London. 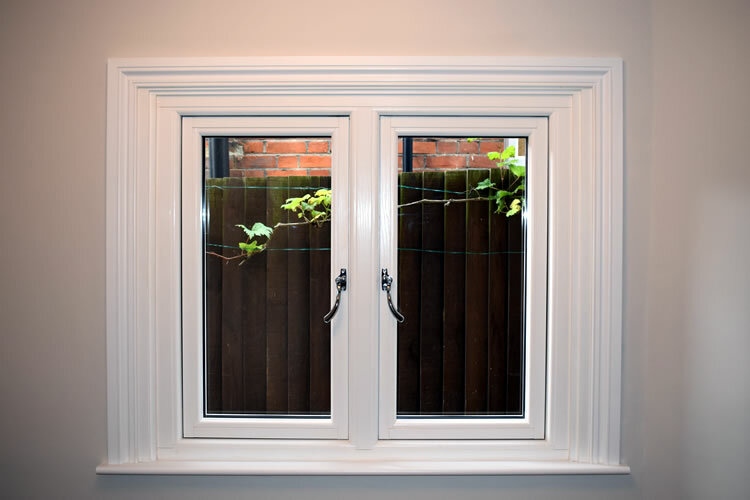 As is often the case, our client found our company by searching online for timber windows and doors. 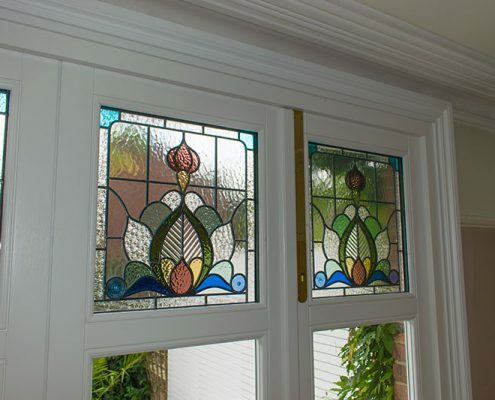 Our sales representative, Nick, visited the property, which still retained the original timber French doors with decorative stained glass in each top-light. 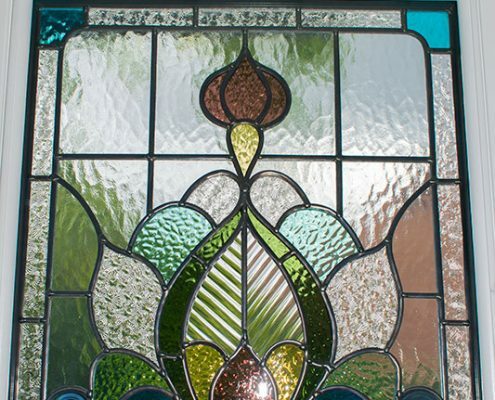 Our client was very specific that the replacement stained glass should match the original design. 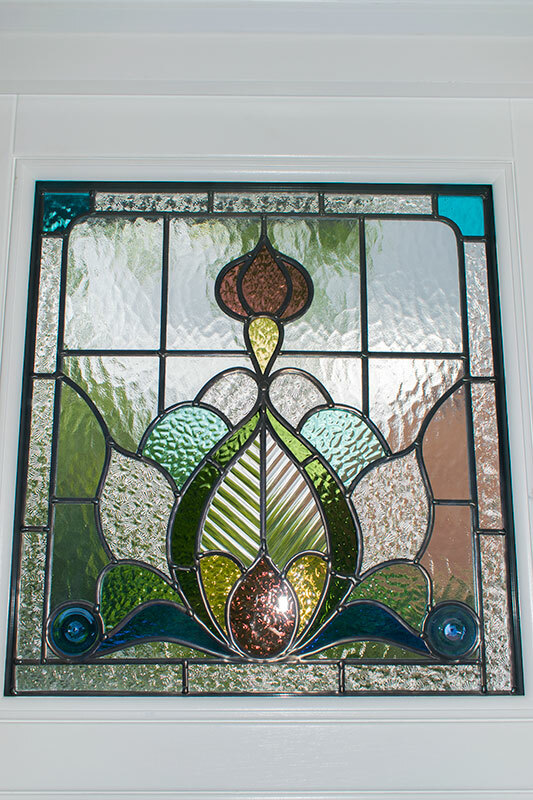 At Enfield Windows, our clients can even visit the stained glass workshop to pick out coloured glass styles and layouts to ensure they are exactly what they want. After the full quotation was sent over, the client came back and placed the order and a survey was arranged. 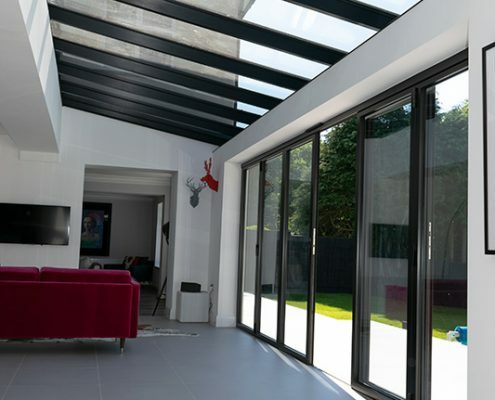 For products such as timber bifold doors or detailed windows, full CAD drawings are created, allowing the client a clear view of the spacing of the frames, the glazing layouts and opening directions. After everything was signed off the order went into production. There’s a six to eight week lead time due to the various processes our timber goes through, from the cutting of the profiles to assembly and painting. 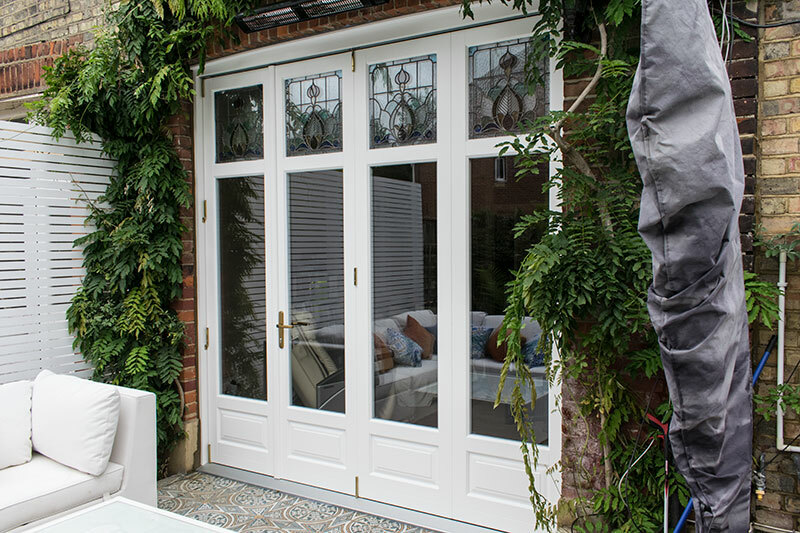 All doors are constructed in the factory to ensure they leave in full working order. Two weeks before delivery an installation date is booked in with our clients. 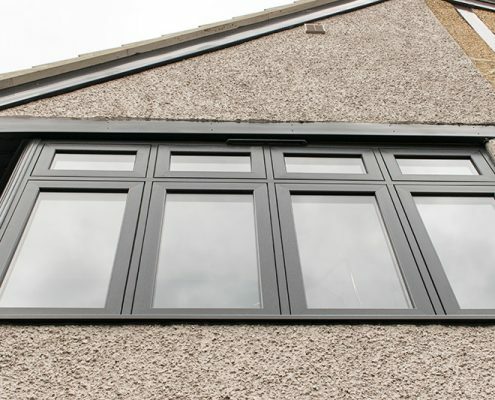 All our Installers are experienced and have a great eye for detail, and unlike many other companies we choose not to work on a schedule of rates scheme which can often lead to a rushed job or corners being cut. 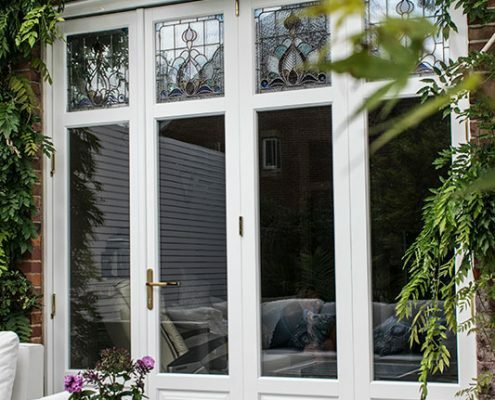 We pride ourselves on the quality of product and workmanship which is featured in so many of our blogs and most importantly our Google reviews. 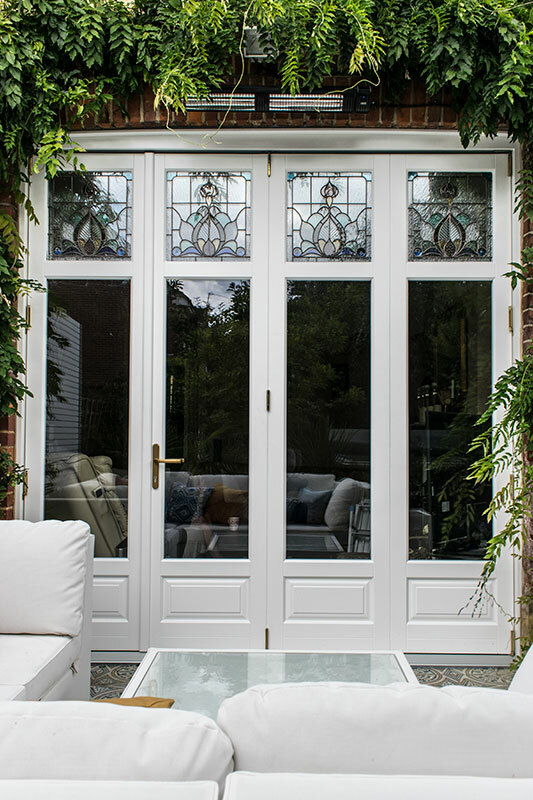 As the pictures show, the finished article is a flawless new timber bi-folding door with stunning replica stained glass units. 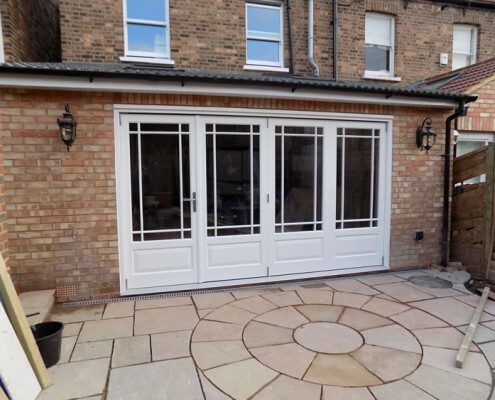 Our client was so thrilled with the installers and the product that he has asked us to quote for work on the rest of his property. 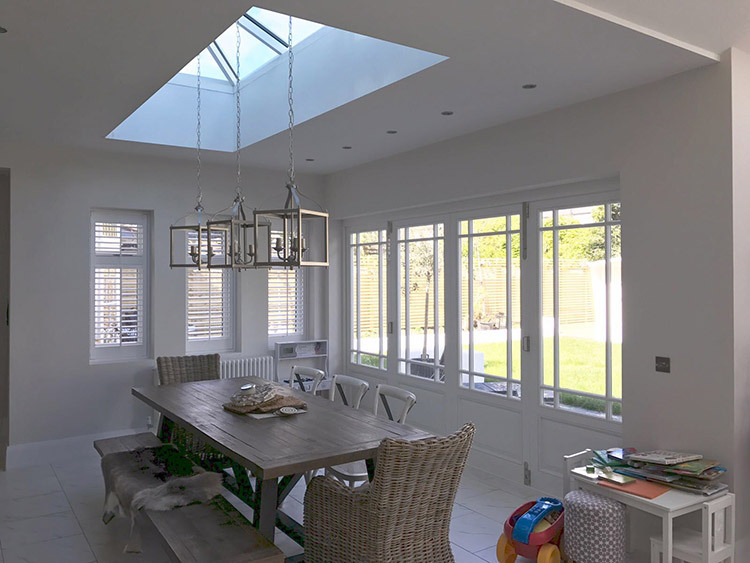 Enfield Windows recently installed timber bi-fold French doors, windows and a skylight to this stunning property in the leafy London suburb of Hampstead. 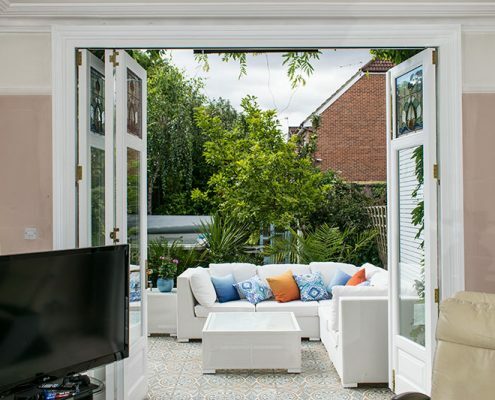 Our client found us after searching online for “timber windows and doors north London.” His most important condition was to retain the character of his home by installing timber units. 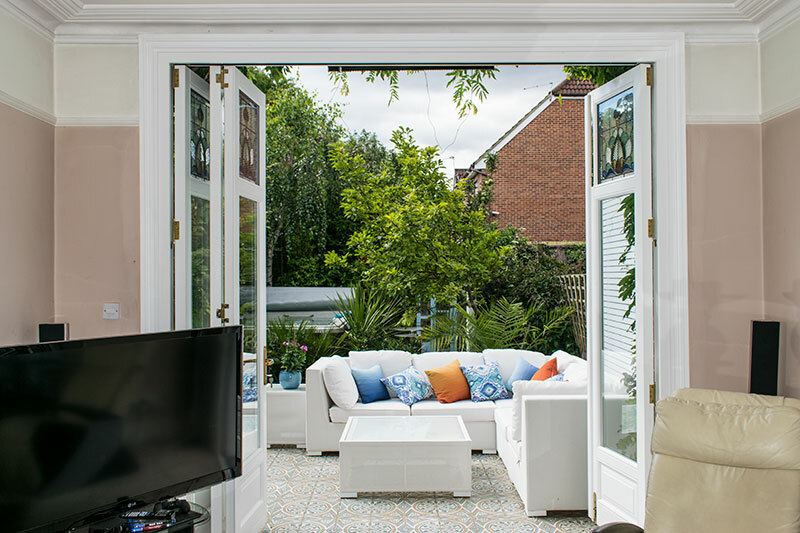 Many of the original windows were still in place, so adding uPVC window frames would have ruined the look and character of a house of this quality. 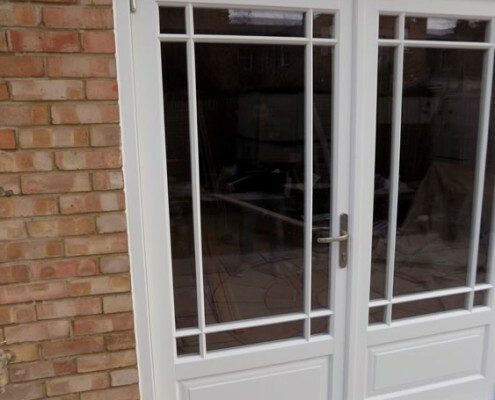 After sending over our fully detailed quotation and CAD drawings, the client decided to make a visit to our showroom where we have numerous timber windows and doors on display, along with an Atlas roof lantern. Our client was impressed by the quality and finish of the products and confirmed his order and contract. 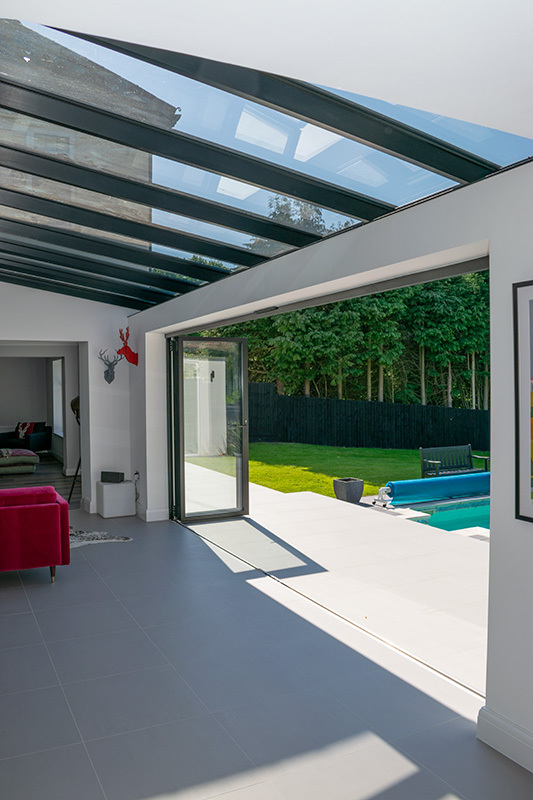 The following week our in-house surveyor went through all the details to arrange production of the new fittings, which included angular windows to be sited above the bi-folding doors. Our timber products currently run on a six to eight-week lead time, as each bespoke product is carefully crafted using the latest state of the art CNC machinery. All finishes are carried out in moisture and dust resistant booths and finished using “Remmers” micro-porous paints. Two weeks prior to delivery, the installation was scheduled in with the builder and our client. 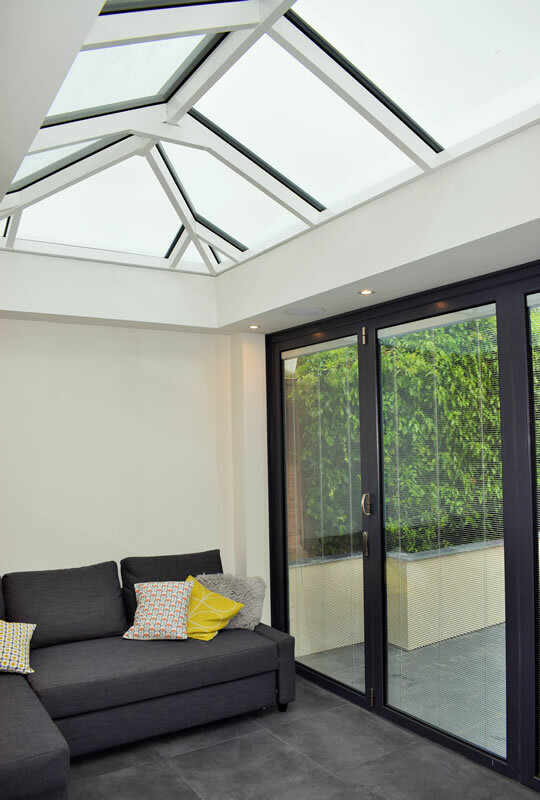 On the first day, the installers fitted the new angled windows above the bi-fold doors and the Atlas roof lantern. On day two the upper windows were installed. These were casement style with Georgian glazing bars. 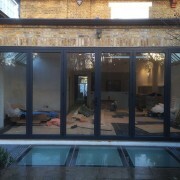 On the third and final day of installation we fitted the stunning bi-folding doors and French doors. 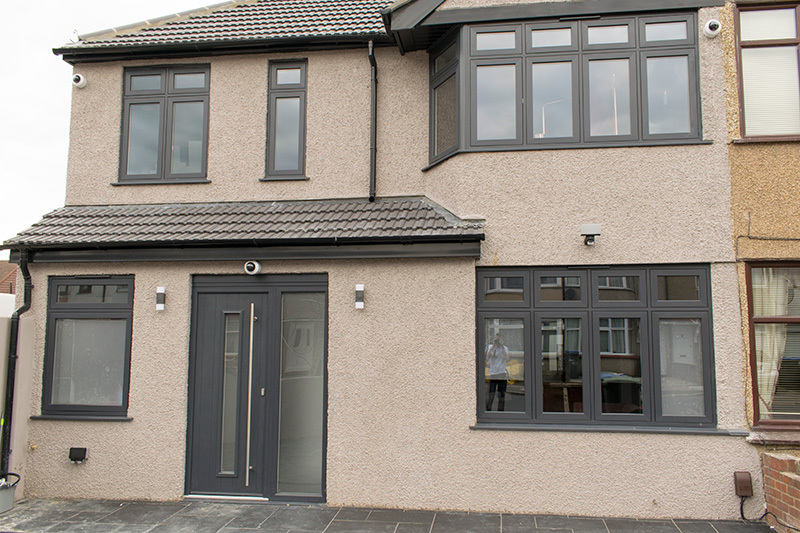 As the pictures show, the renovation was a great success and the windows and doors have contributed to a clean and bright new look. 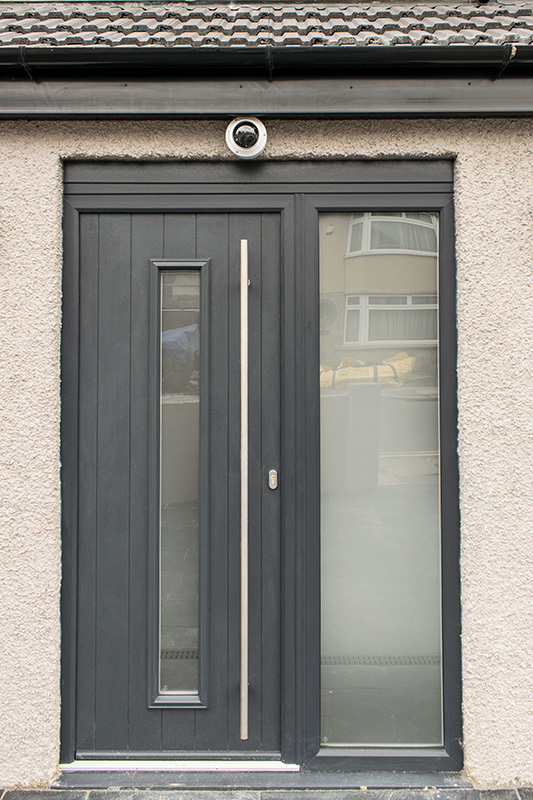 This installation was a classic example of how the use of quality timber products will enhance and add value to a property – something that is rarely achieved by using cheaper uPVC or aluminium. 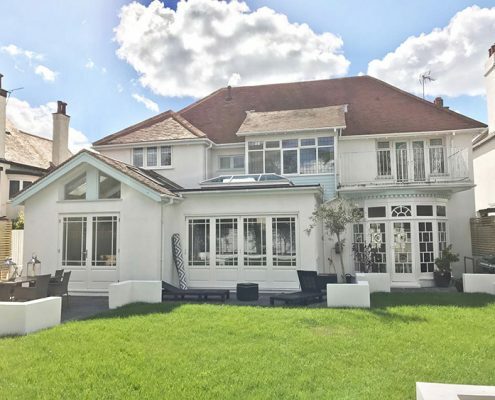 On properties such as this, making the extra commitment to install timber windows and doors gives back the character and quality many homes have lost since the uPVC surge of the 1980s. 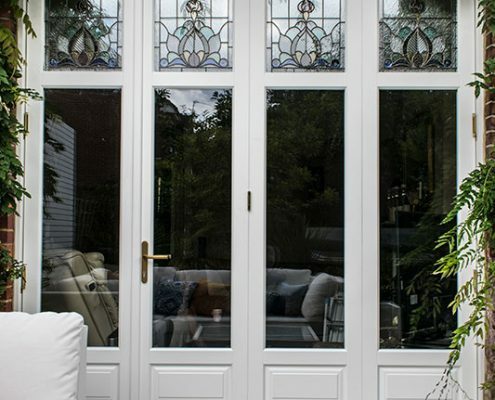 In recent years, timber has made a huge comeback on period properties and with reputable suppliers using the finest production and finishing methods, your home makeover can be truly stunning. These days just about everyone does an internet search if they want something done. 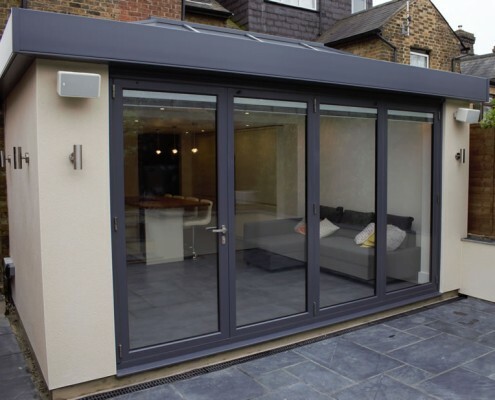 Well if you Google aluminium bifold doors in London, Enfield Windows will come out at Number One! 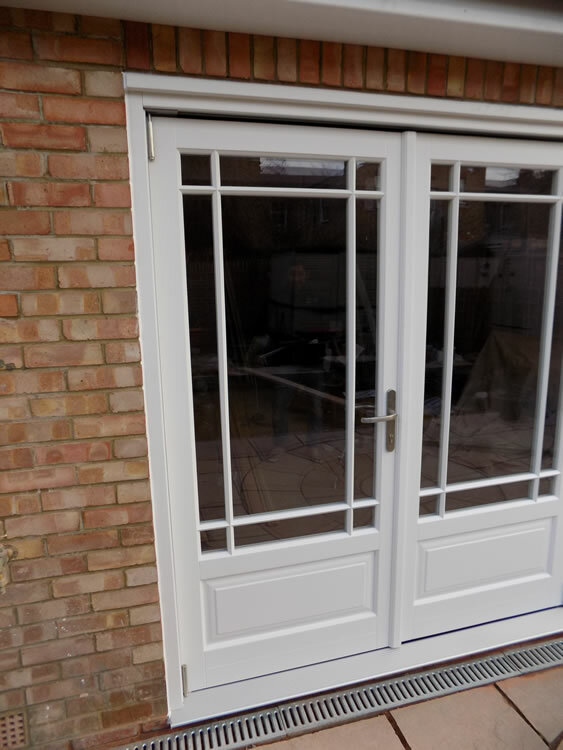 Thanks to that online search, we have just completed a major installation for a client in the Chingford area, where we fitted large bi-fold doors and an apex window — and all in double quick time. 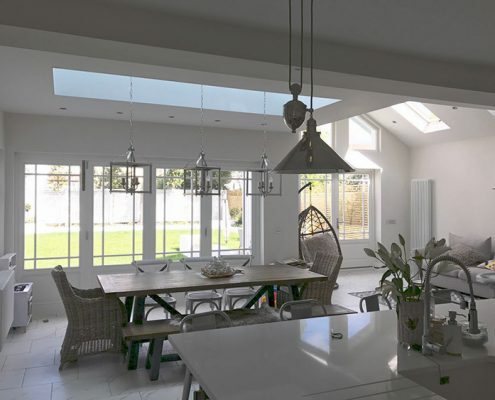 Our client wanted his new extension to be flooded with natural light, so we were just the right people to call upon. 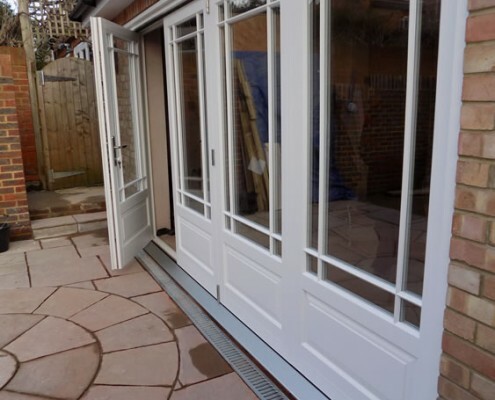 We started by discussing in detail the desired design, colour and opening direction of the doors, along with the all important question of threshold depth for a flush and even finish. 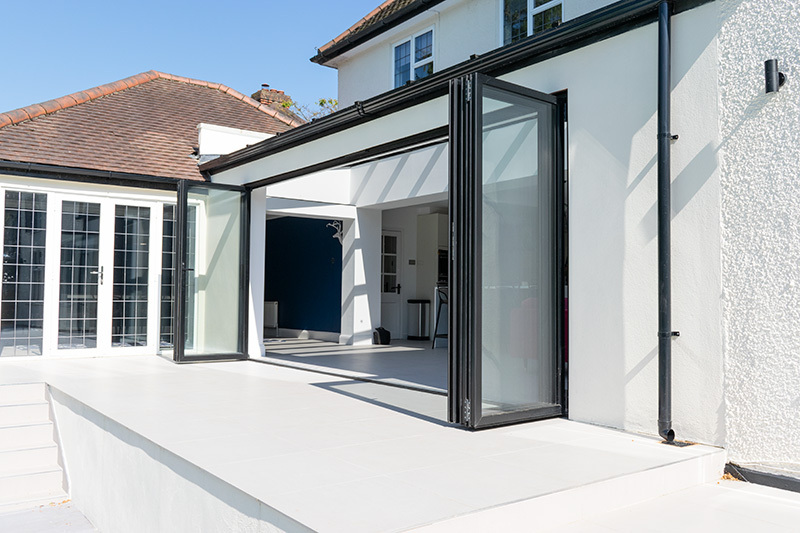 After emailing a quotation from our in-house pricing system, our client came to our North London showroom where we have a 4.5 metre four-part “Origin” bi-folding door on display, plus all the available stock colours and hardware options. 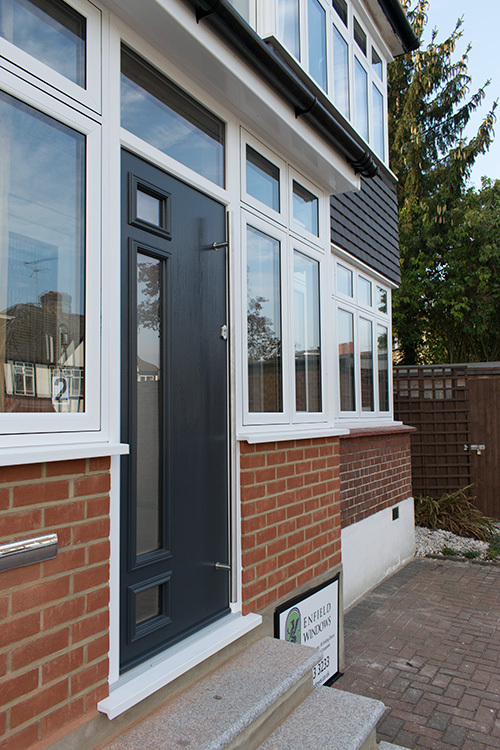 Enfield Windows is a premium “Origin” installer with award-winning staff, fully trained to install all our products to the highest level. 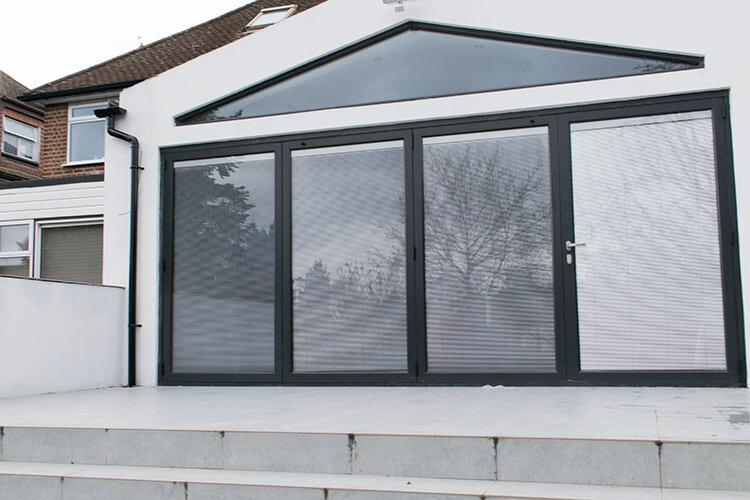 Most of our doors are glazed using A-rated 28mm toughened glass units, but we also offer internally glazed blinds which are a great alternative to hanging up nets, curtains or external blinds. 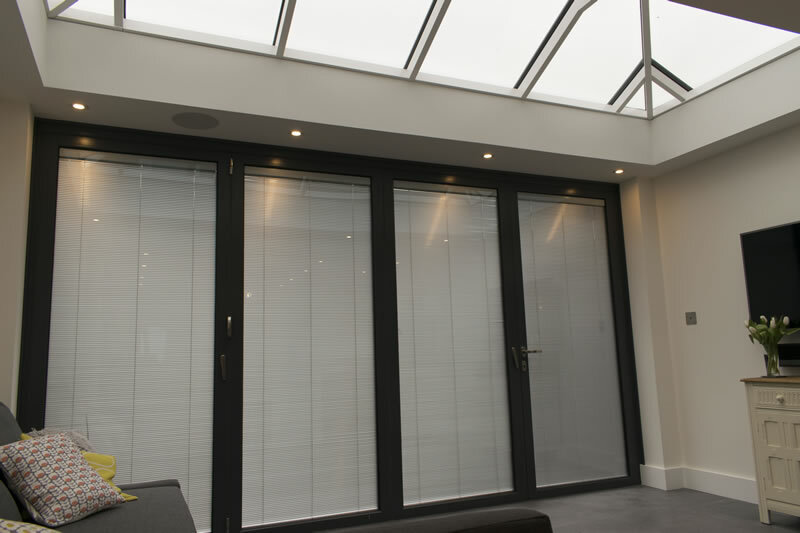 These internal blinds are contained within the two layers of glass, giving a clean fuss-free finish. Also, from a maintenance point of view, there is never any need to clean and dust the blinds. 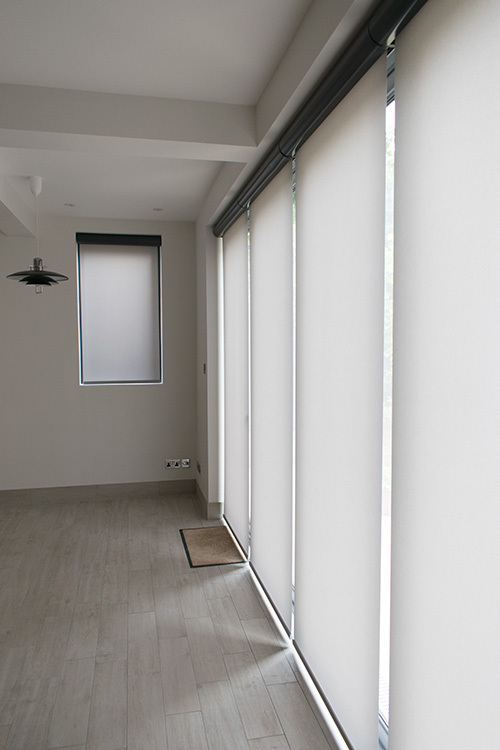 On this installation, electric internally-glazed blinds were part of the package. These are hardwired into the mains and operated with a neat remote control. The lead time after survey was two weeks for the manufacturing of the window and doors and a further week for the blinds. 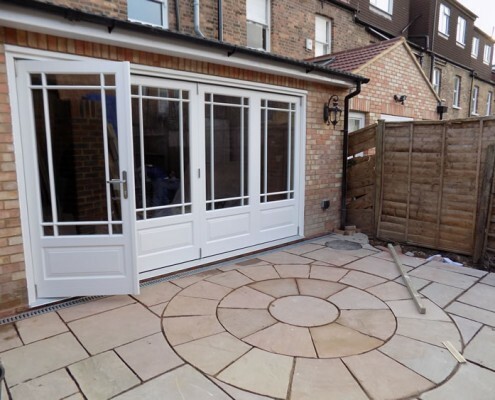 The installation was carried out without any problems and the client was very happy with the new look for his house. 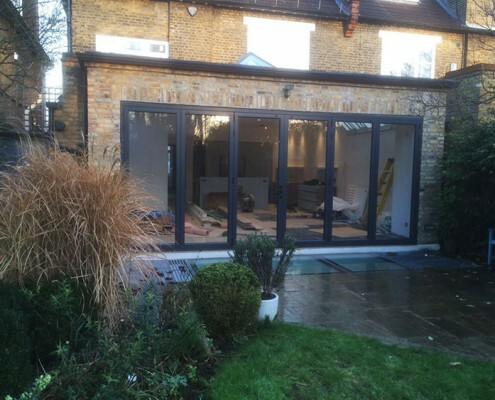 Our most recent installation was carried out in Winchmore Hill, north London. 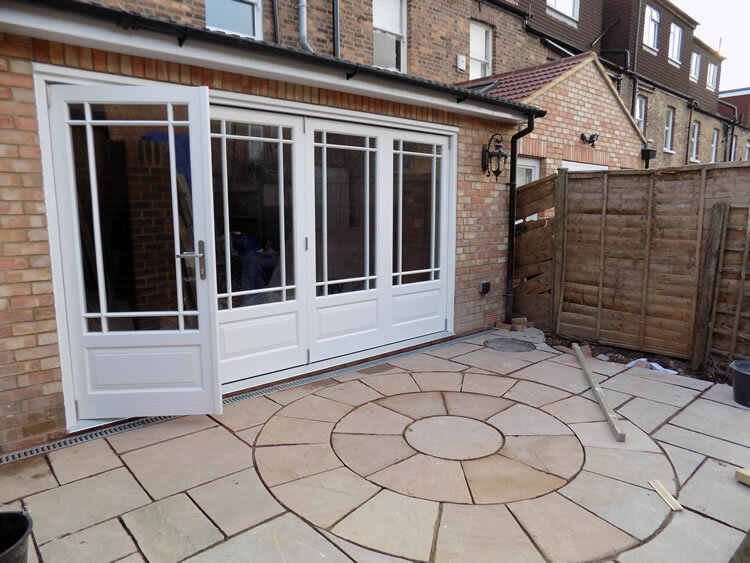 After searching online, the client approached Enfield Windows looking to change the both the windows and doors at the front of their property, and add doors to the new rear extension. 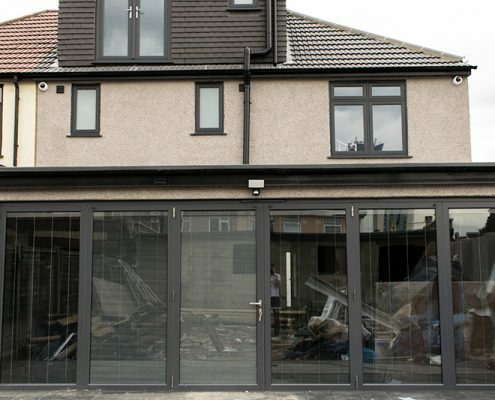 The products required for the rear were to be Anthracite Grey RAL 7016 Bi-folding doors and for the front uPVC windows and a composite front door. 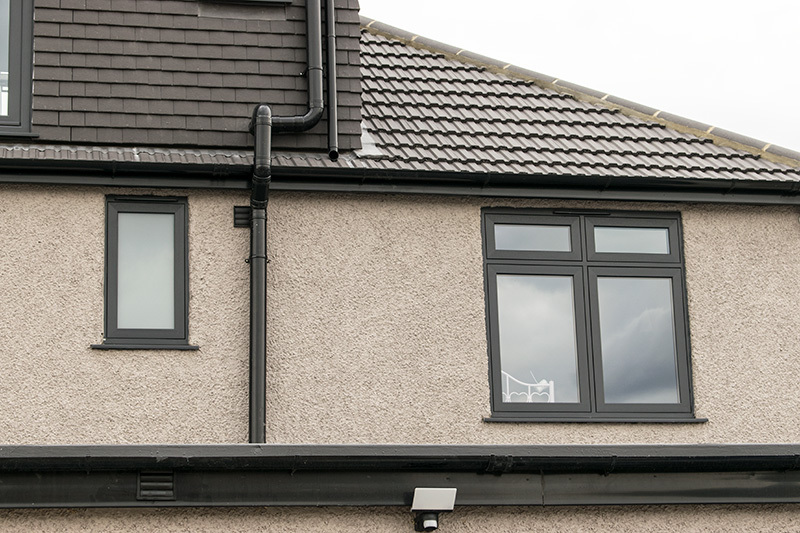 After looking around at many companies which offer various styles, the client impressed with the flush casement windows we supply and install. 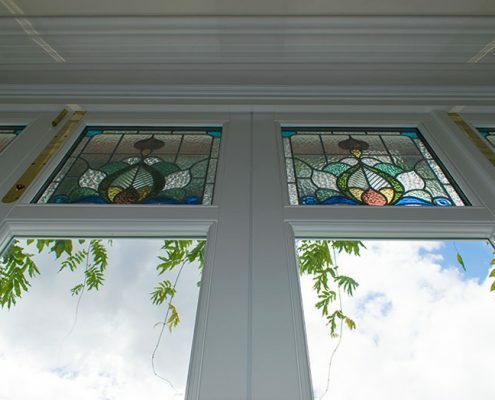 These windows give properties within this period more character than the typical uPVC windows on the market. From outside, the appearance of these frames are completely flush as would the originals had been. 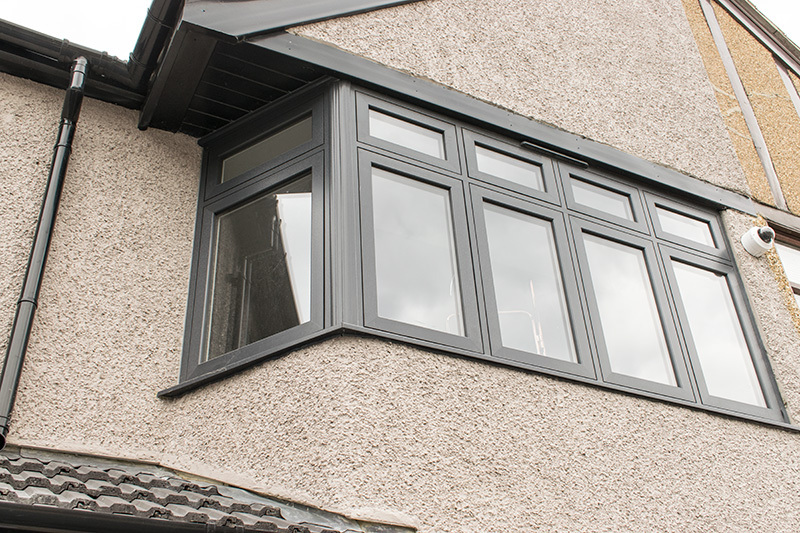 Also, from a price point over the Residence 9 Windows and timber windows, the cost is considerably cheaper while still offering all the thermal efficiency and security you would come to expect. 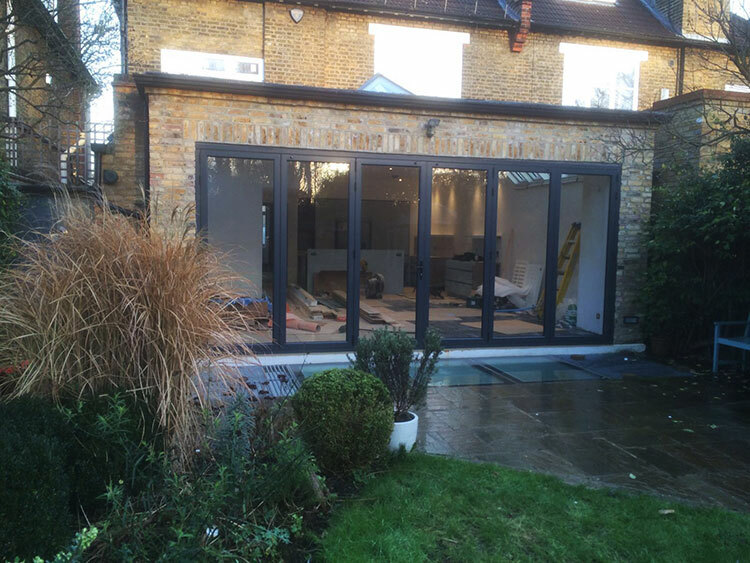 For the bi-folding doors, due to the large width of the new extension, the client opted for a five-part system over a six door configuration. 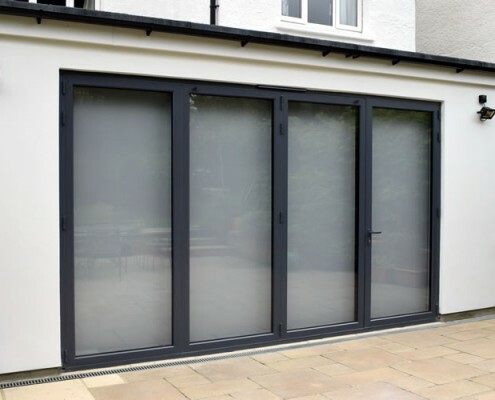 This provides more glass space while also enabling easier day to day use that people commonly look for when choosing bi-fold doors. 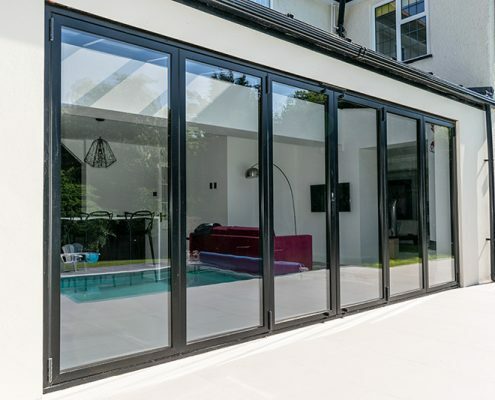 Our aluminium bifolding doors come with a no quibble twenty-year manufacturers warranty on all working parts, giving you complete confidence in the product and of course, peace of mind. 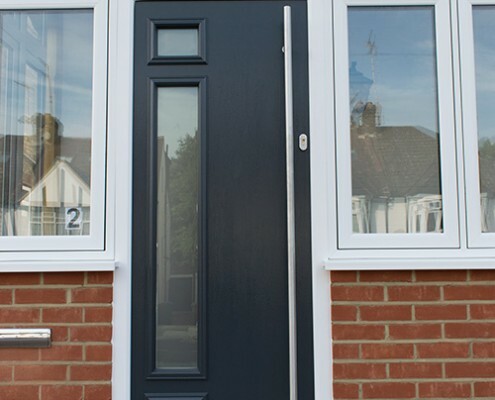 The composite front door was selected from the Solidor range, a beautiful door with a timber constructed core. This timber core offers not only strength and durability, but the weight also gives a feel of quality over foam filled doors. Once the cost was agreed and contract finalised the survey was booked. After the survey, the order passed to the Operations Manager who placed the order for manufacturing. During the manufacturing process, the installation was booked in to be carried out over four days. 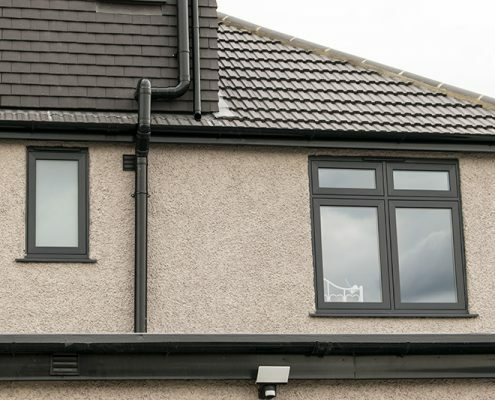 Our skilled in-house installers carried out the installation and as the pictures show the windows and doors improved the appearance of the property. 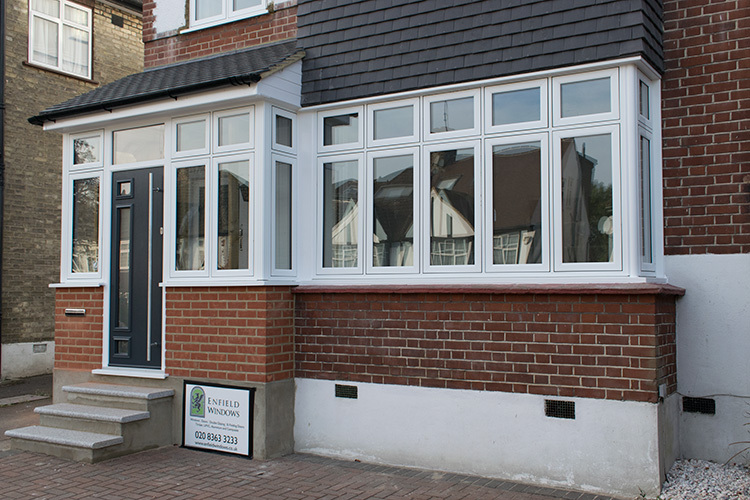 For more information on flush casement windows, we supply and install please visit our showroom at 149 Chaseside Enfield. 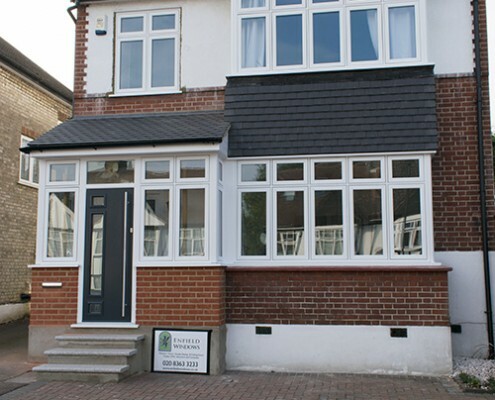 Another recent installation by Enfield windows was in the North London area. 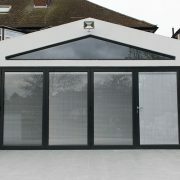 We were recommended to the customer by the prestigious high-end building company, A&R Designs. 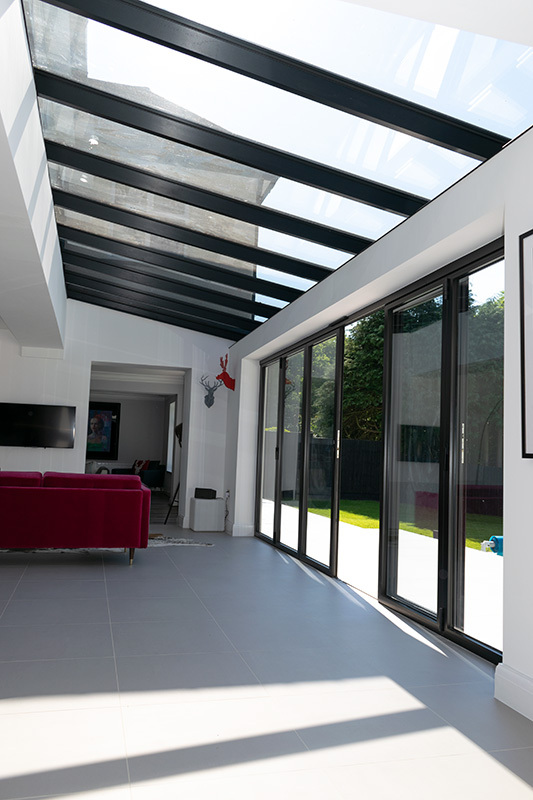 The brief for A&R Designs was to create a contemporary modern extension using high quality products throughout. 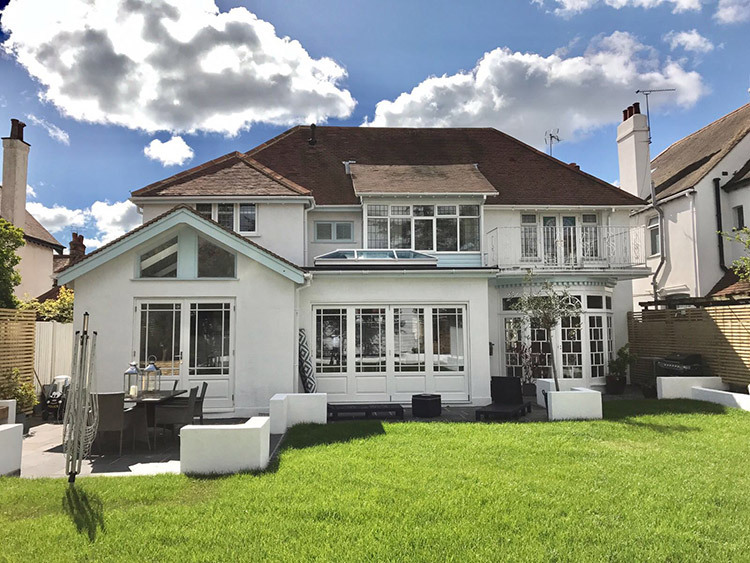 Enfield Windows were first invited to the property to examine the initial requirements and to understand exactly what the client wanted to achieve. 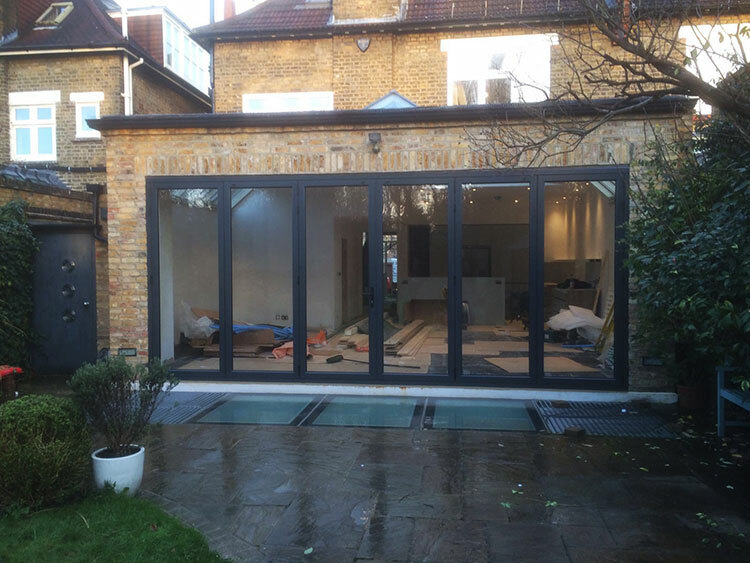 At the rear of the property, the client wanted a large four-part set of Origin Aluminium bifold doors, opening up into the garden. 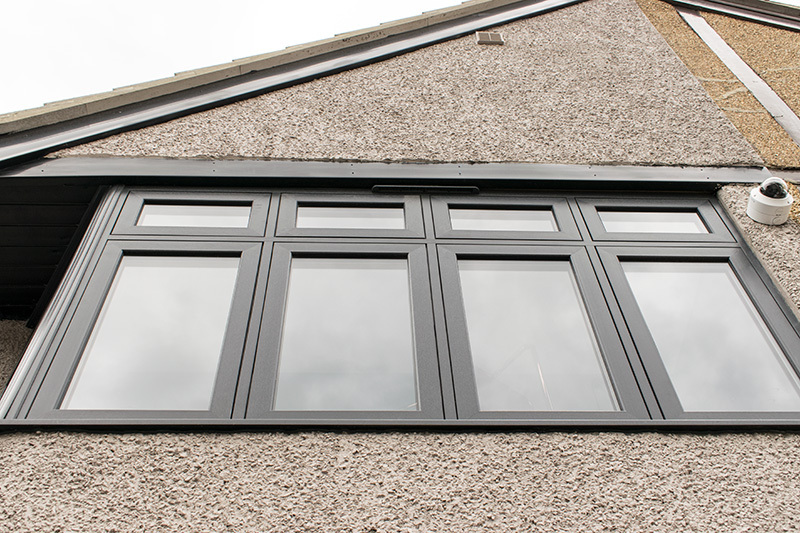 They also wanted three Origin windows running down the side access, which were all part of the new extension. 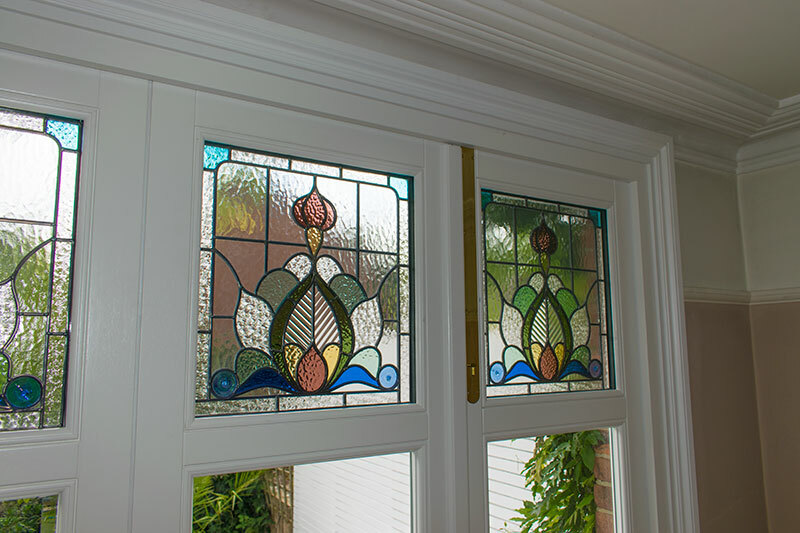 In the hallway, to keep in tune with the original theme, the client opted to use the Residence 9 Window, a stunning timber replica totally maintenance free while not compromising on the features you would expect from a traditional looking window. 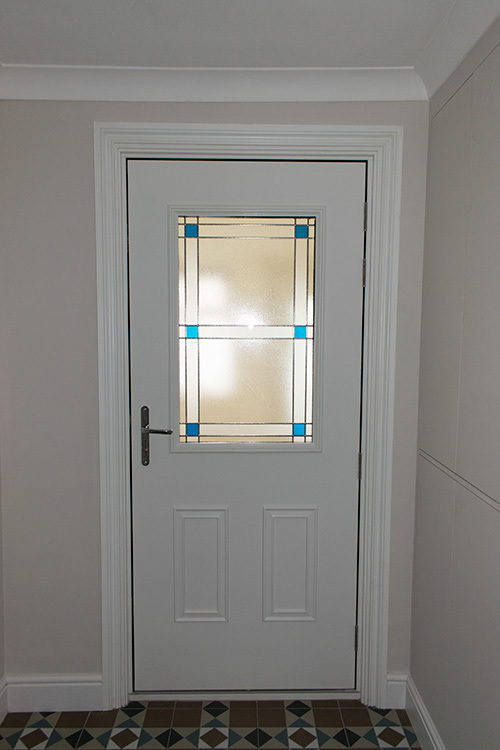 The internal front door was to be replaced using the Masterdor, an engineered factory finished timber door. 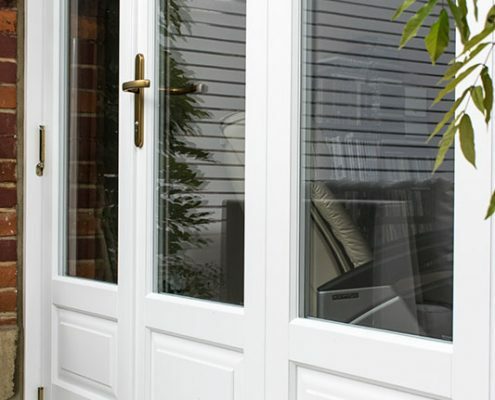 This product is fast becoming the new alternative to uPVC composite doors. The measurements were taken, and a fully detailed quotation was sent within 48 hrs. The client accepted our competitive quote. They then visited the showroom to view all the products and get a firm feel for the quality each item offered. 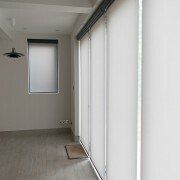 While at the showroom the client had decided to install the Origin blinds. 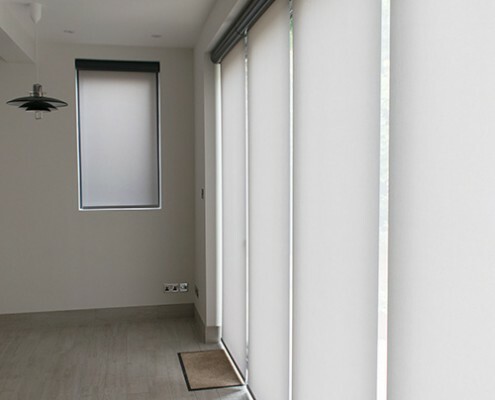 These are electronically operated blinds and are a great addition to any Origin product. Controlled using a compact remote, they can function independently or in tandem. 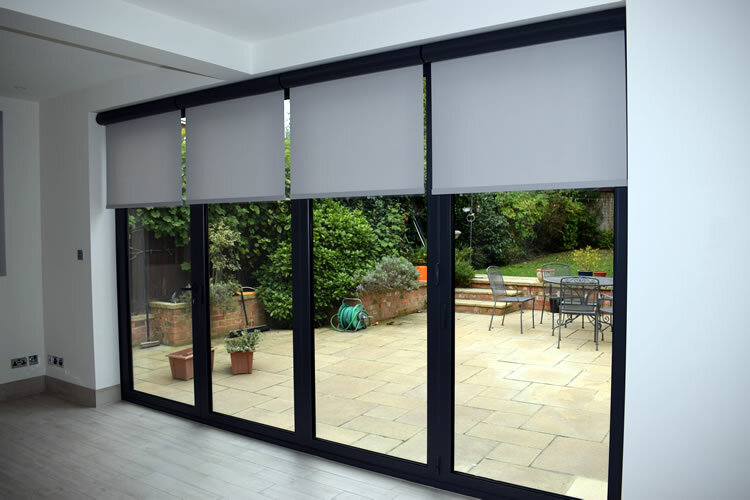 They not only offer shade and privacy but add a real wow factor to any windows or doors and come in over 200 fabric ranges ensuring a match for any scheme. After completing the contract and finalising the details, a survey was carried out. Within three weeks, the majority of the products were installed as and when the building contractor required them. The whole installation ran smoothly and efficiently. 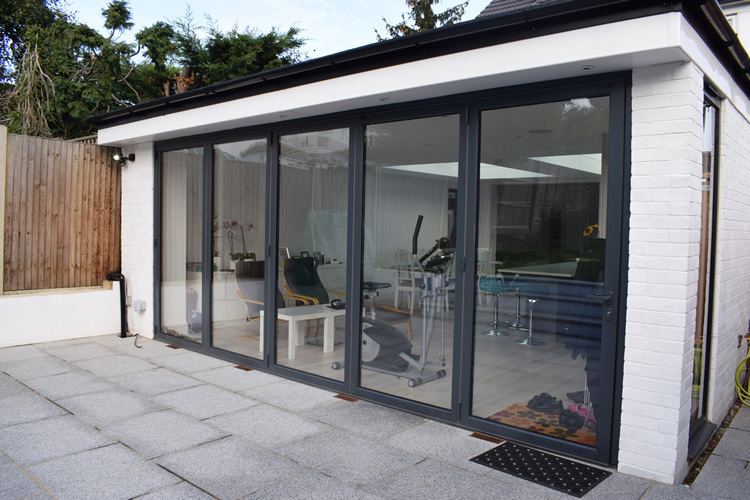 All items were installed by our Origin trained fitters, and the completed pictures show how the products add to the overall quality of finish to the stunning new extension. 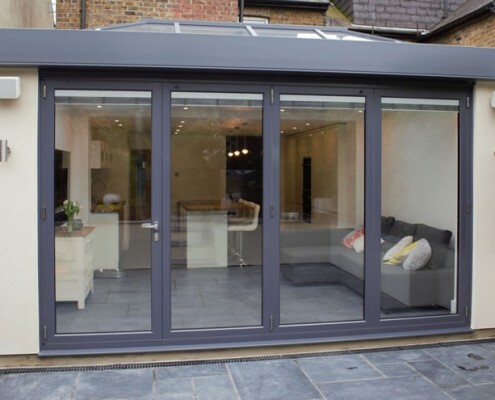 Our most recent Conservatory installation took place in Ware, Hertfordshire. 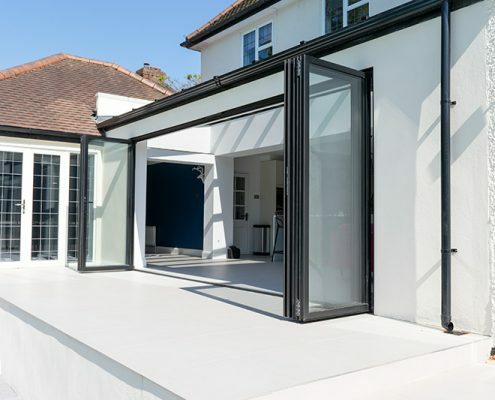 We were recommended to our client by the high end Hertfordshire based building company Oliver James Construction who specialise in creating modern contemporary living spaces. 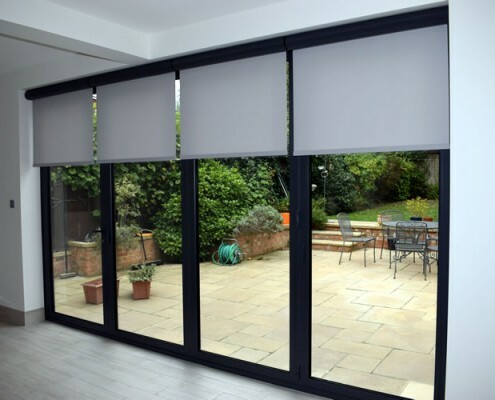 The client visited our showroom where the salesman went through specifics for the conservatory including colours, glazing, bi-fold doors and the options for internally glazed blinds. 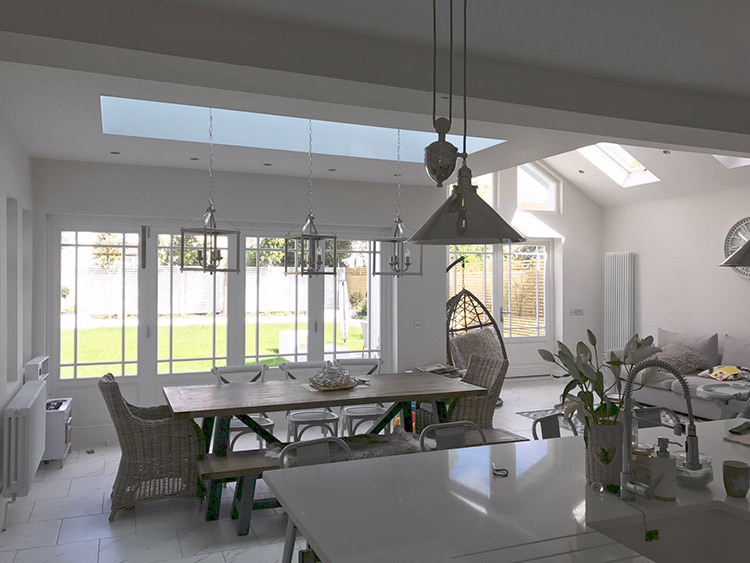 Once the plans were finalized our sales team in liaison with Atlas, the manufacturers, put together detailed CAD drawings of the proposed space, which gave the client an insight of what would be the finished conservatory. 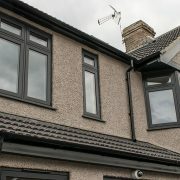 The colour chosen was RAL 7015 “Slate grey” for the exterior roof lantern and fascias. 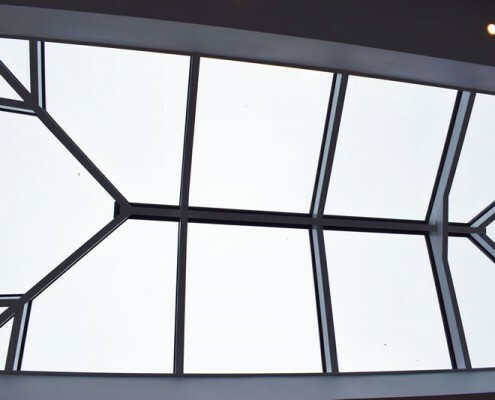 Internally the skylight lantern was to be white, and glazed using 24mm self-cleaning solar controlled active neutral glass. 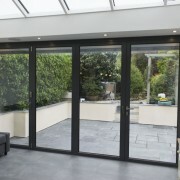 The doors were a four part bi-folding system made by Origin who supply high quality windows & doors. They offer optional colour-coded or stainless steel handles hinges, colour-coded anti finger pinch gaskets and the accredited SBD Secured by design police approved locks. 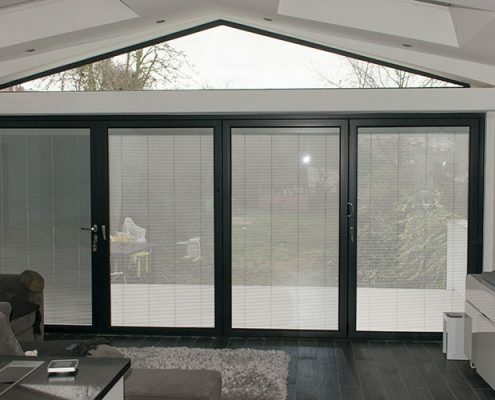 These are all covered with a twenty year peace of mind manufacturers guarantee. 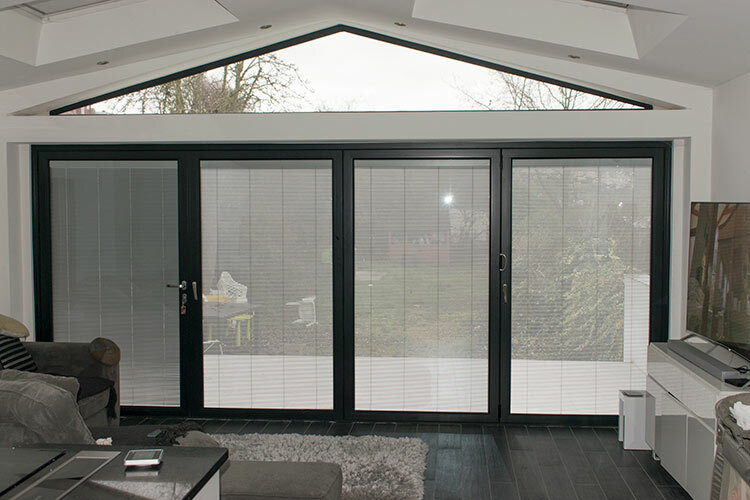 Glazed in the bi-folds were 28mm argon filled electrically operated blinds which were hard wired to the mains and operated by remote control. 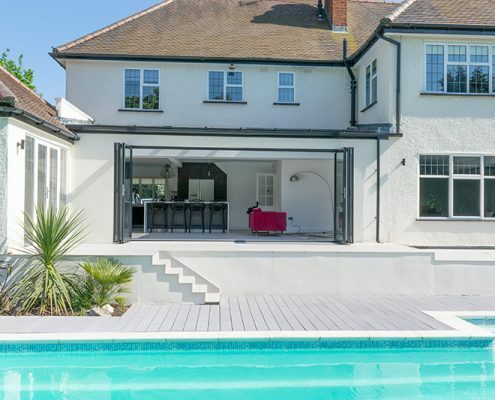 This stunning addition gave the perfect wow factor to the project whilst also closing off the south facing garden at the press of a button. 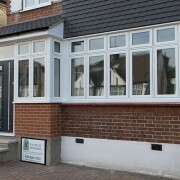 Enfield windows part in the project was carried out over four separate days. 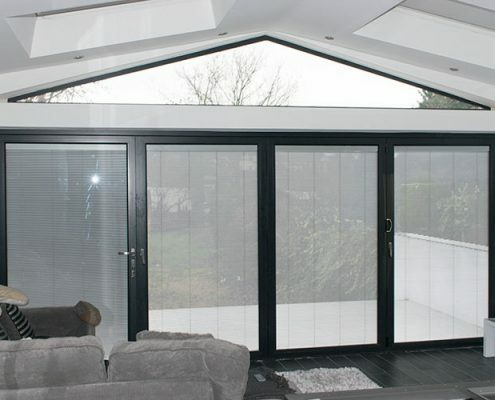 The first two were spent on the installation of the conservatory followed by the bi-fold doors and then finally installing and wiring the electric blinds. The client was overwhelmed with this stunning addition to their property. 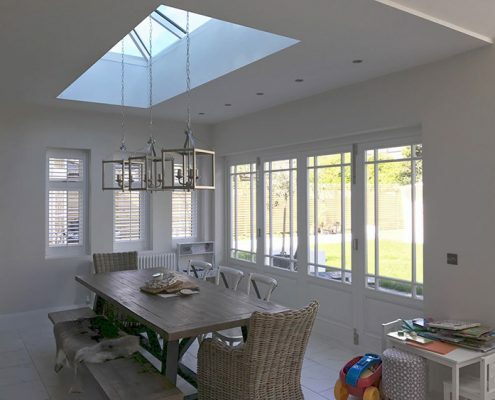 The pictures show how these new living spaces are fast becoming the modern day conservatory design. 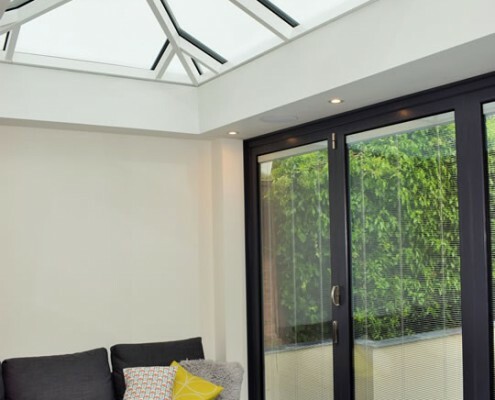 For more information on Oliver James Construction and the Atlas Skyroom conservatory why not visit our showroom where our sales advisers can explain the process and offer a full detailed quotation. 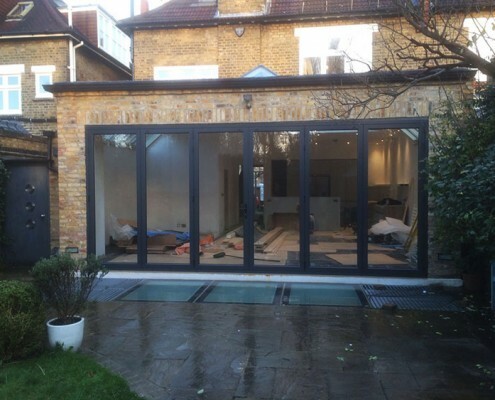 One of our recent timber bi-folding door projects was in the Ealing area of London. 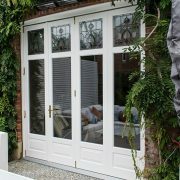 The client had found pictures of our timber door range whilst searching Google images. 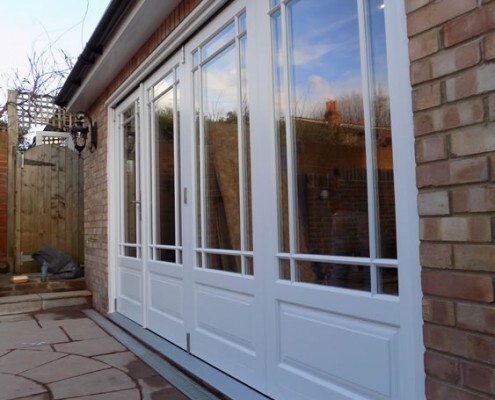 After looking at our website, the clients requested a timber bi-folding door made using timber hardwood. 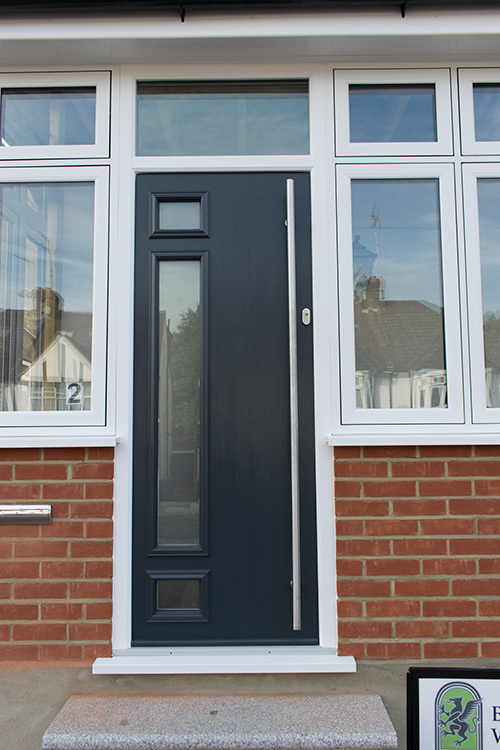 What makes Enfield Windows doors different from market alternatives is the timber we use. It is supplied in either Baltic Pine, Oak or the more popular hardwood. 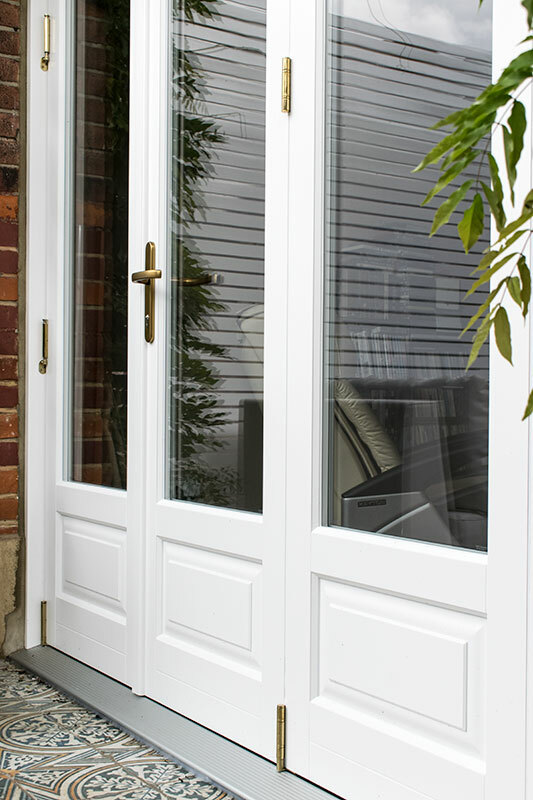 Everything is engineered cross grained, which helps the door resist against warping, twisting or swelling. 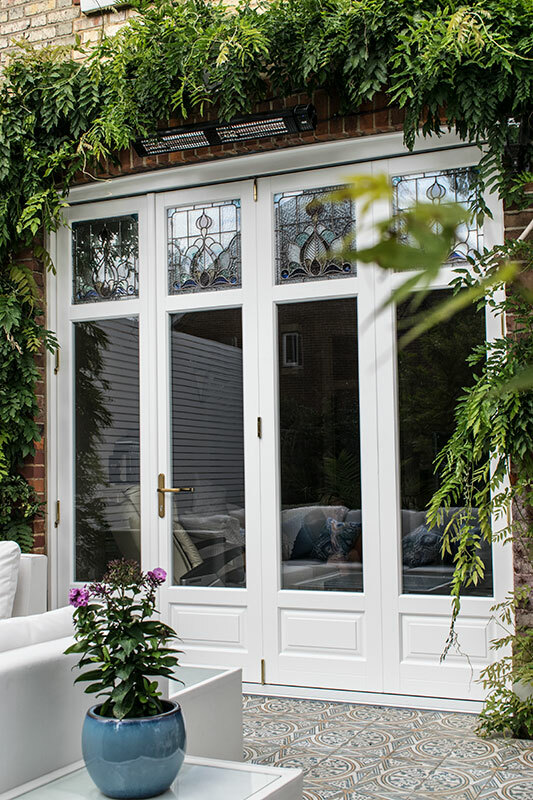 This is unlike many other timber doors, which are often crafted using a single piece of timber. 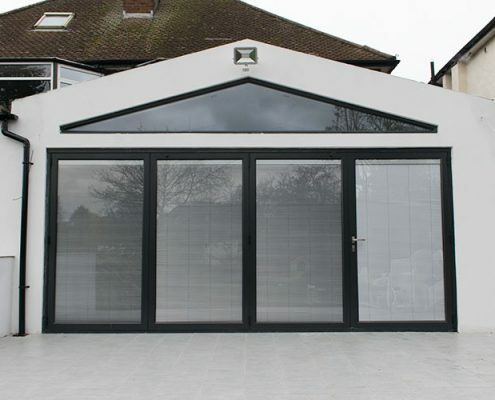 Along with the fully engineered doors and frame is the unique two week factory finished spraying process. This takes place in airtight, chemical state of the art spray booths giving a perfectly even finish every time. 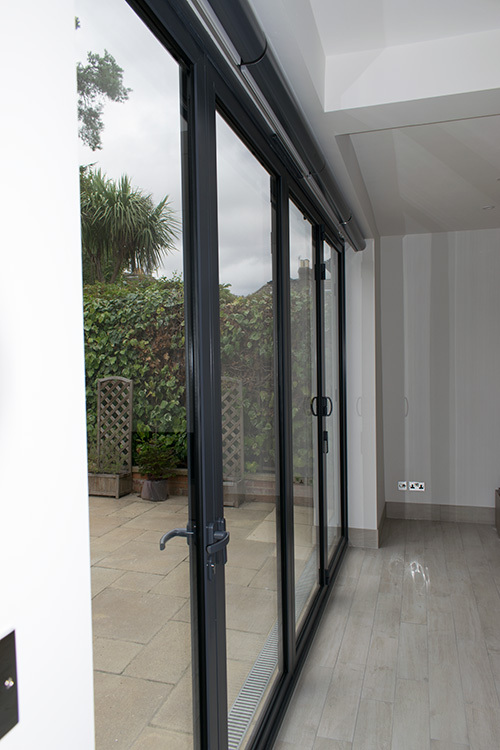 The glazing consists of 24mm toughened Argon filled double glazed units which also offer a low U-value of 1.2. After the quotation was given and accepted we then carried out a detailed site survey where the aperture finished floor levels and opening configurations were checked and confirmed. The next stage was to process the order and issue the client with a detailed CAD drawing (as above) to show every detail. This is a design specification we carry out for all of our timber products once an order is confirmed. 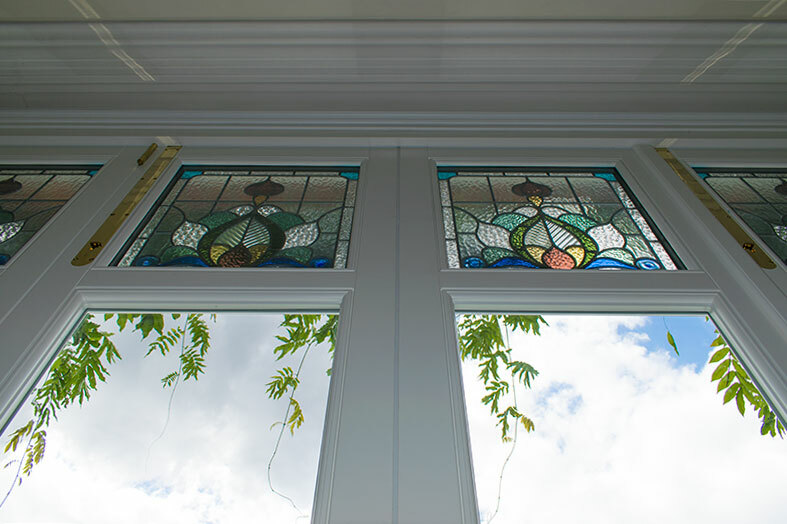 The lead time for our timber windows and doors is approximately six to eight weeks from survey. 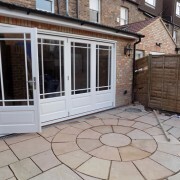 The installation was booked in with the customer two weeks prior to delivery. 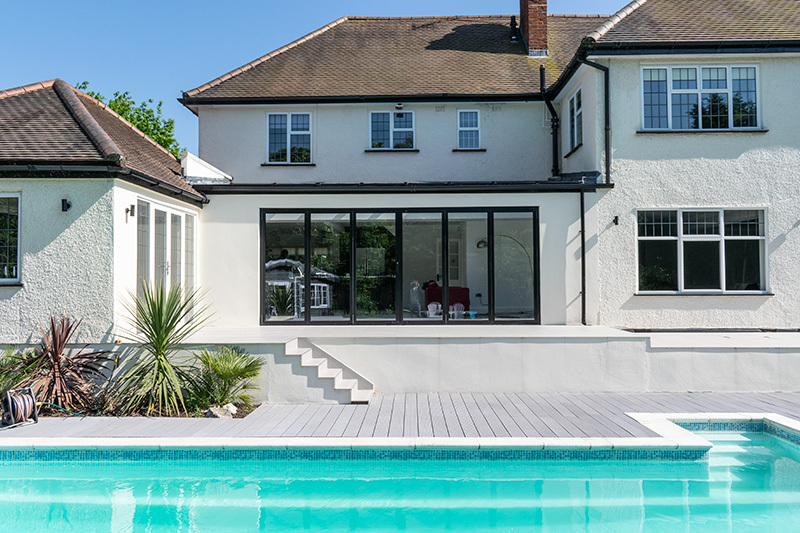 It was carried out in one day by our very own skilled timber team who carry out all of our timber installations in and around the north and central London areas. 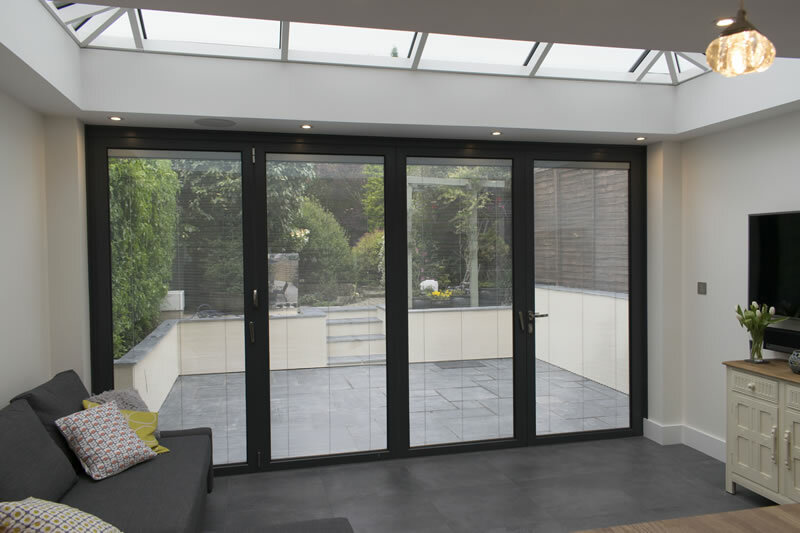 As the pictures above show, these are stunning timber bifold doors, beautifully built and finished. 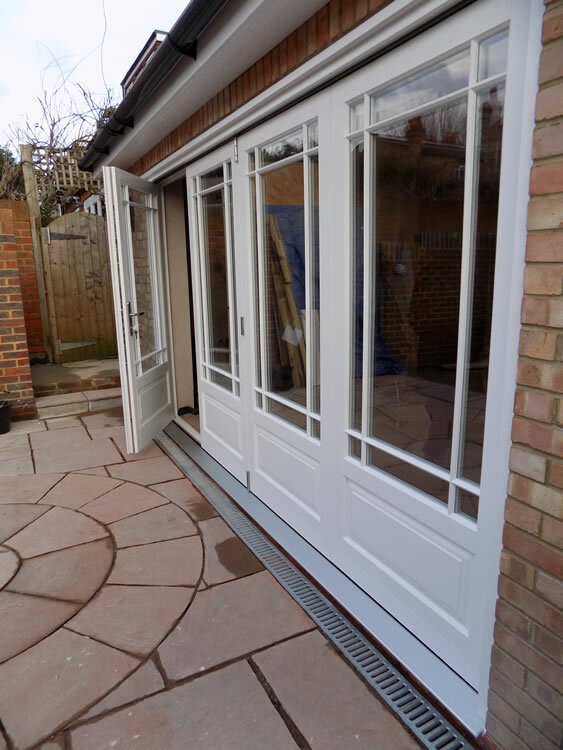 Our next Timber Installation will be in the Knebworth area in the coming week where we will be installing matching timber bi-folds and French doors. 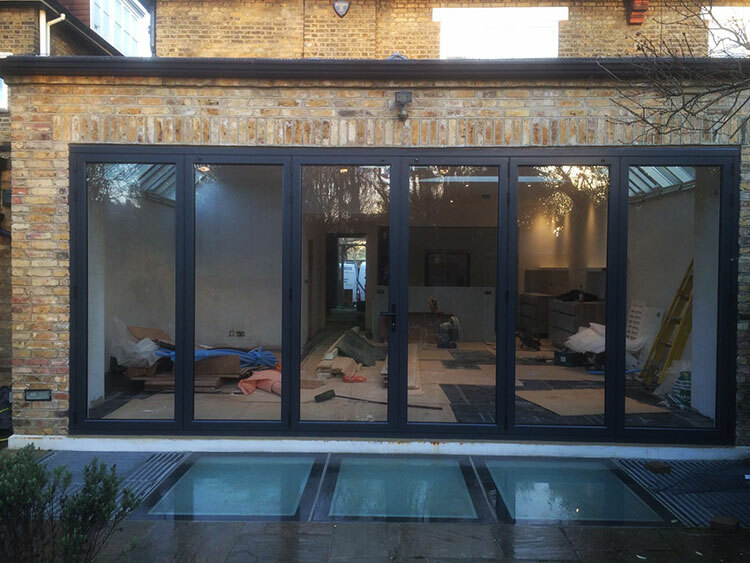 Enfield Windows recently installed an immaculate set of Origin Bi-folding doors to a property in Fulham, London. 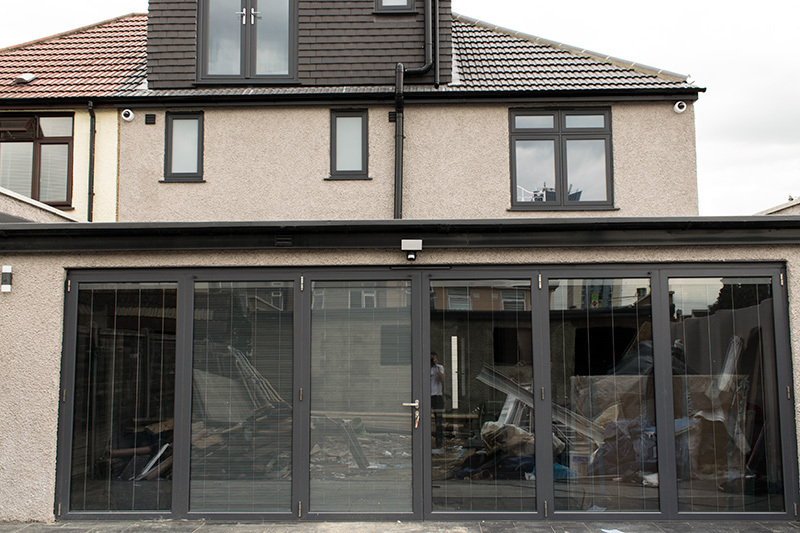 BTL property services were undertaking a complete refurbishment of the property and the bi-fold doors were to be a key aspect of the renovation. 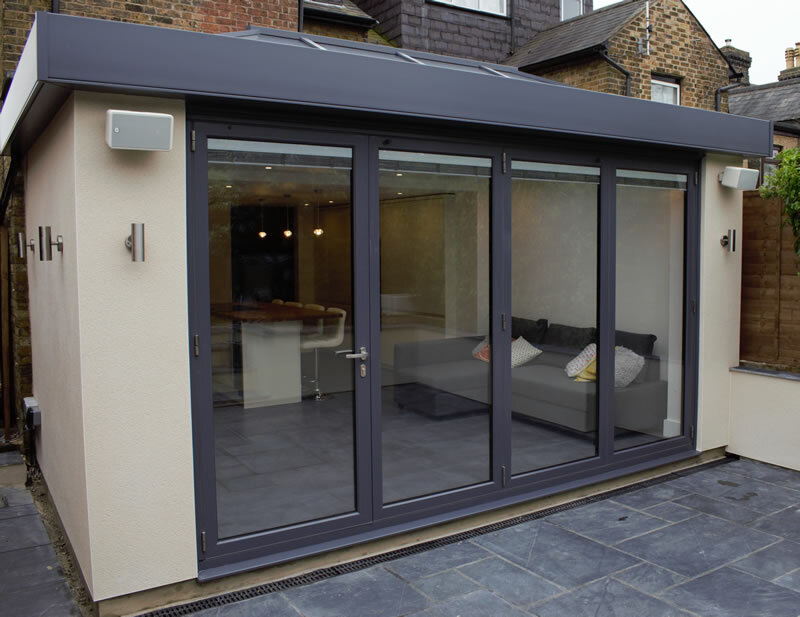 Spanning over 5.6 metres, these six part doors covered the entire rear of the property. 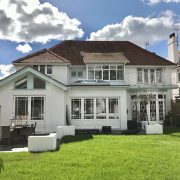 BTL property services have offices based in Fulham and Chelsea and are a specialist high end refurbishment and building company. Their attention to detail they offer is second to none. 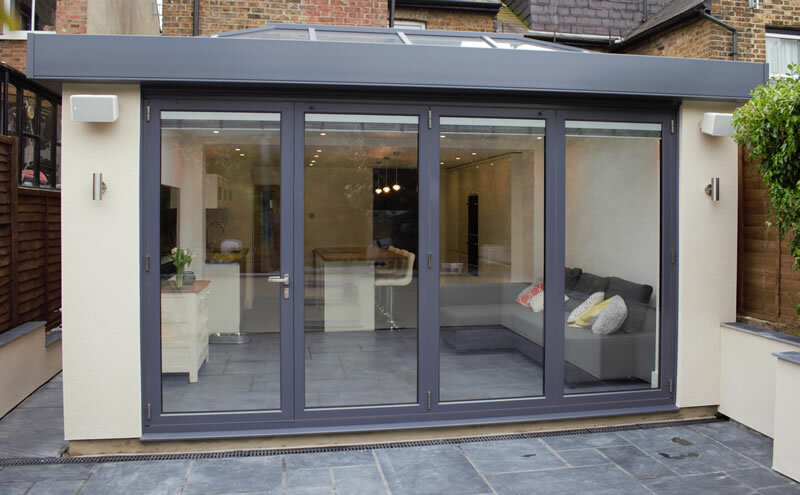 Enfield Windows have worked on projects previously, supplying and installing products and we are pleased to say we have built a good relationship. 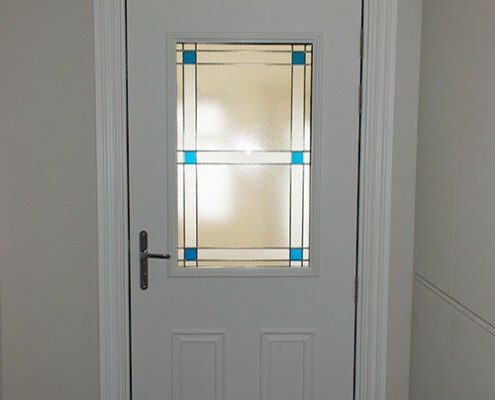 The original doors to be replaced were also aluminium but of a lesser quality which caused the client many issues. 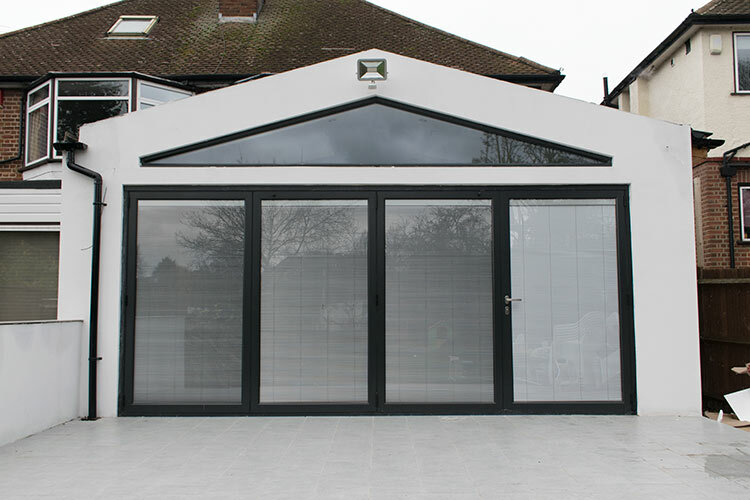 With bi-folding doors the key thing to remember is the quality and strength of the brand. 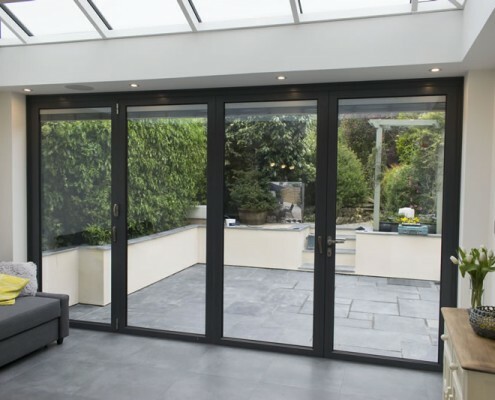 Origin are arguably the leading bi-fold door manufacturers in the UK. With a state of the art facility they are able to turn around their doors within five working days, an industry first. 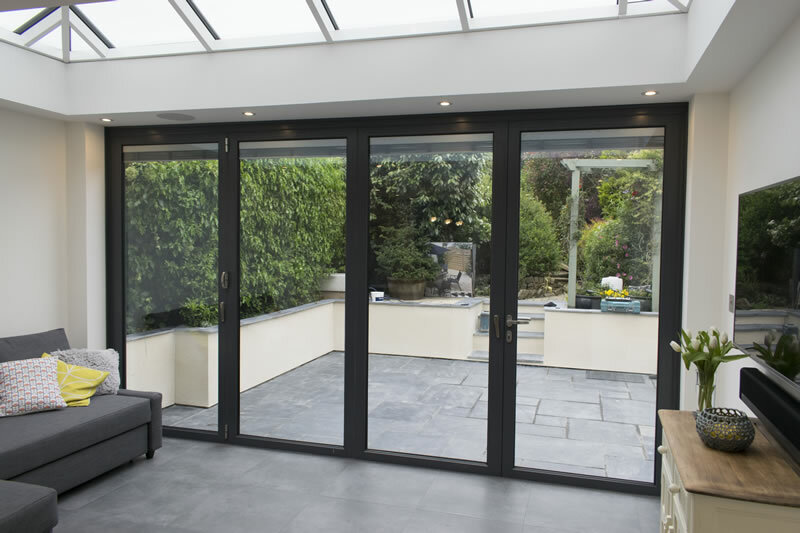 Along with the speed of manufacturing, Origin are able to offer a twenty year guarantee on all working parts of their bifold doors. 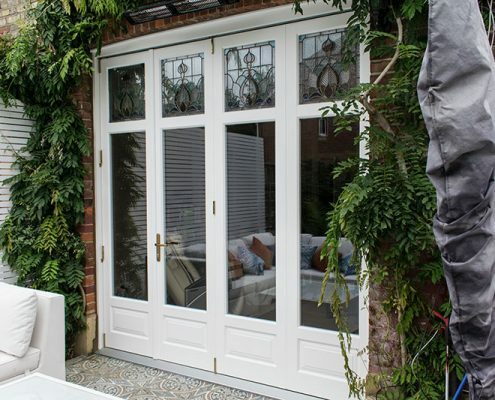 This is a testament to the quality of build and parts that are used in constructing these beautiful doors. 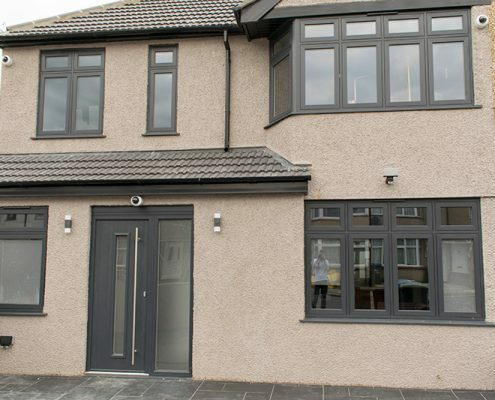 This particular set was to be manufactured in the ever popular Anthracite Grey. The client opted for standard handles, hinges and gaskets although Origin do offer colour coded or stainless steel plus the optional colour coded gaskets. 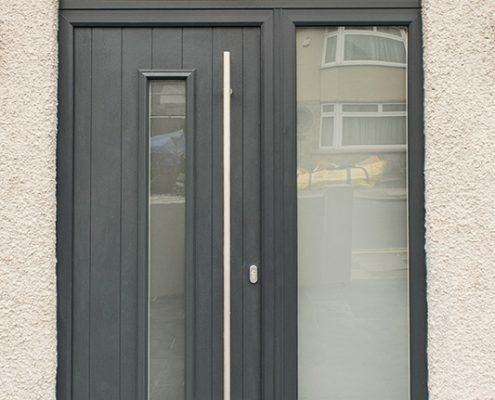 After survey was complete the doors were ordered and installed the following week by our two full time trained Origin installers. 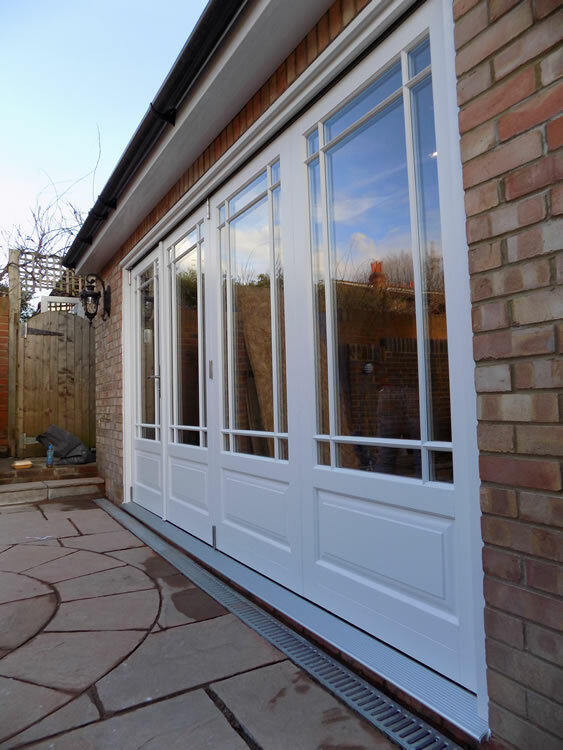 As the pictures show, our one day installation was completed successfully and the client was over the moon with the new doors and the smooth ease with which they operated. 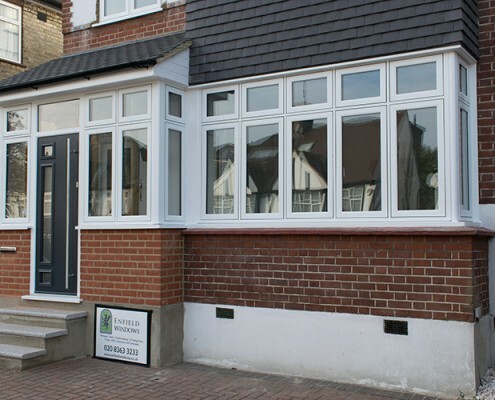 At Enfield Windows we have a price promise. 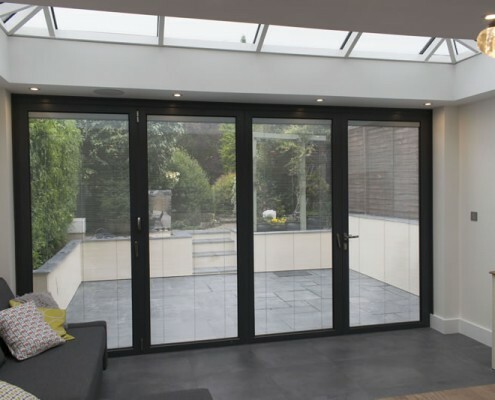 Due to the volume we supply and install of bi-folding doors, our aim for all of our clients is to better any like for like quotations.